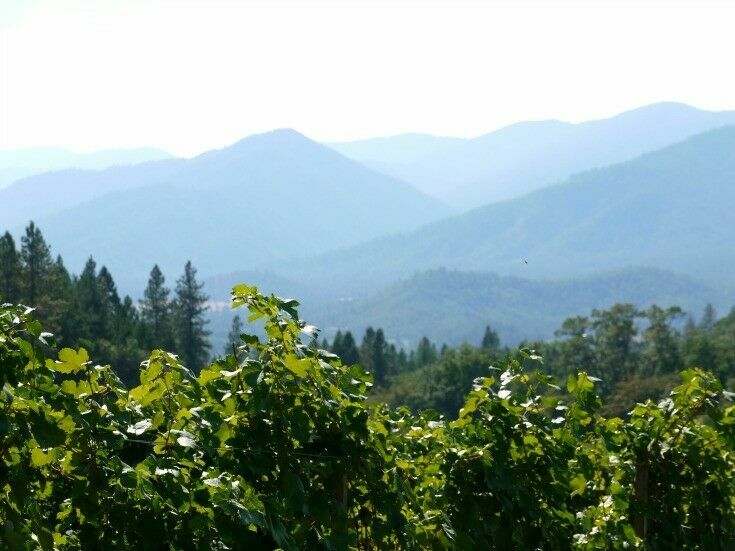 Take a drive on The Applegate Valley Wine Trail and experience the best of Southern Oregon wine country: stunning scenic beauty, small-town warmth, uncrowded tasting rooms, and artisan winemakers committed to their craft. 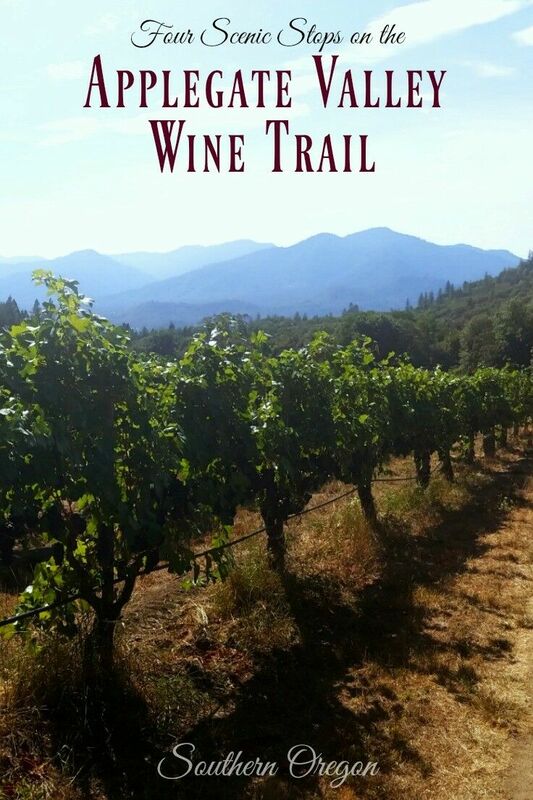 Extending for 50 miles, from the California border to Grants Pass along the Applegate River, the fertile Applegate Valley is home to “fragrant lavender fields, meticulous small family farms growing organic produce, roaming herds of grass-fed cattle, and numerous vineyards and wineries.” [Applegate Valley Wine Trail] So whether you are on a quest for the perfect bottle of Oregon wine or just want to take a beautiful drive through Southern Oregon back-country, you’ll find what you’re looking for on the Applegate Valley Wine Trail. 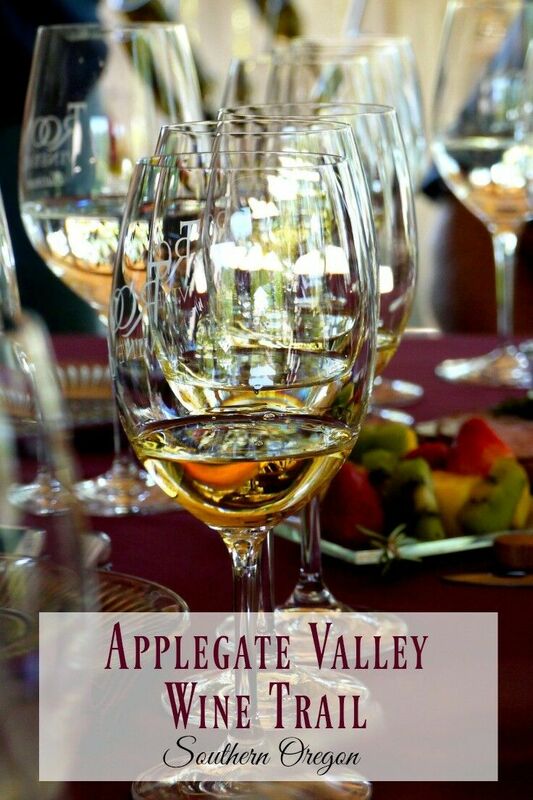 At this time, the Applegate Valley Oregon Vintners Association includes eighteen unique wineries that produce a diverse array of wines. 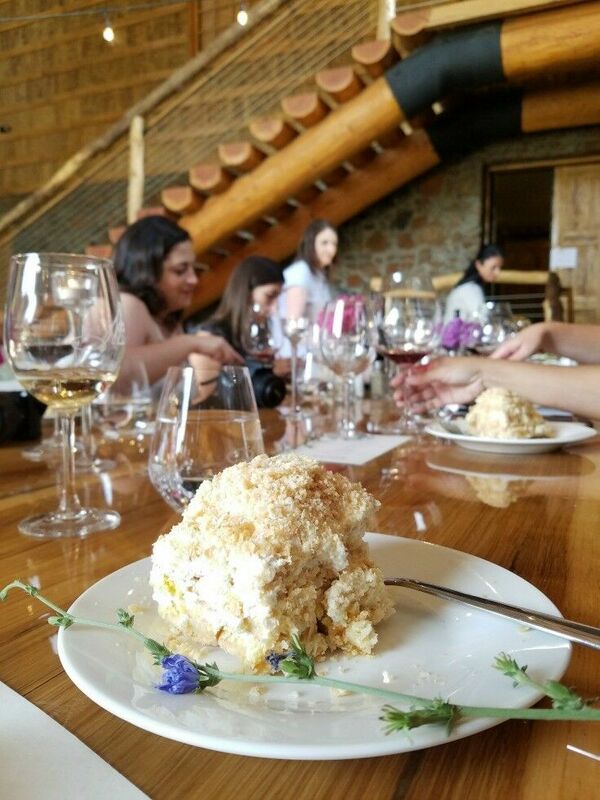 Today, we’re sharing some highlights from four of those wineries – a perfect itinerary for a day of sightseeing and wine-tasting! 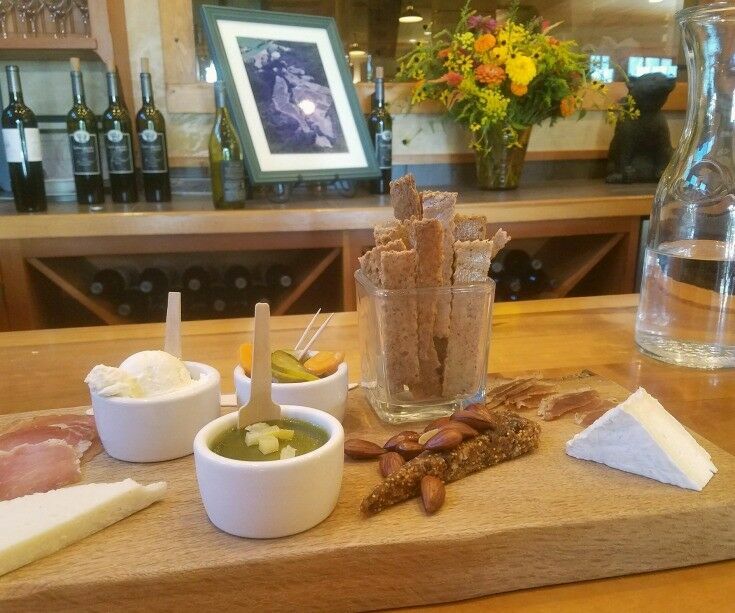 Specialties: Small batch estate wines, sustainability and stewardship, congenial conversation, artisan cheeses, and charcuterie. 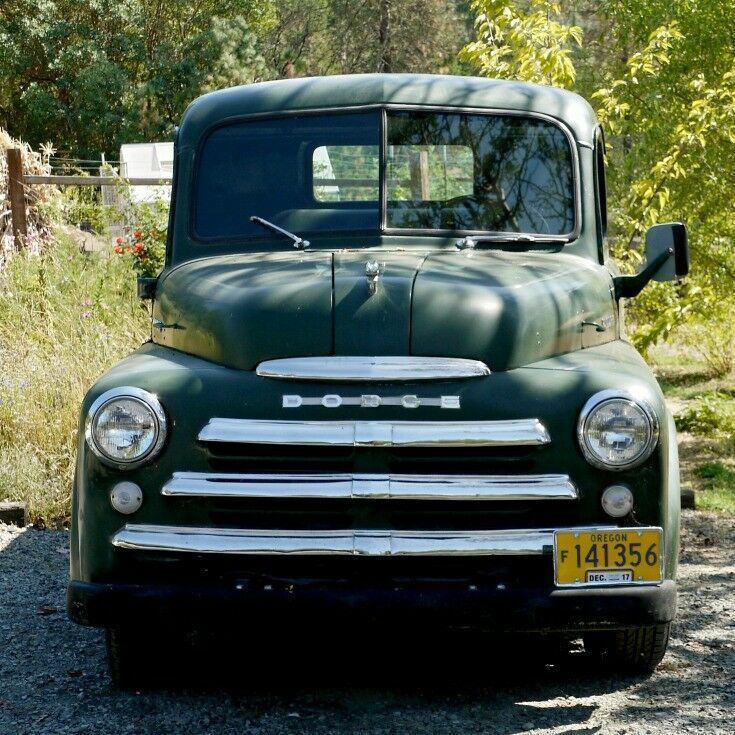 First established as a “hobby” vineyard back in the ’70’s, Wooldridge Creek has evolved over the decades into a thriving vineyard, winery, creamery and charcuterie business. Owners Ted, Mary, Greg, and Kara adhere to seven-generation principles, a philosophy that is clearly reflected in their dedication to both community and stewardship of the land. 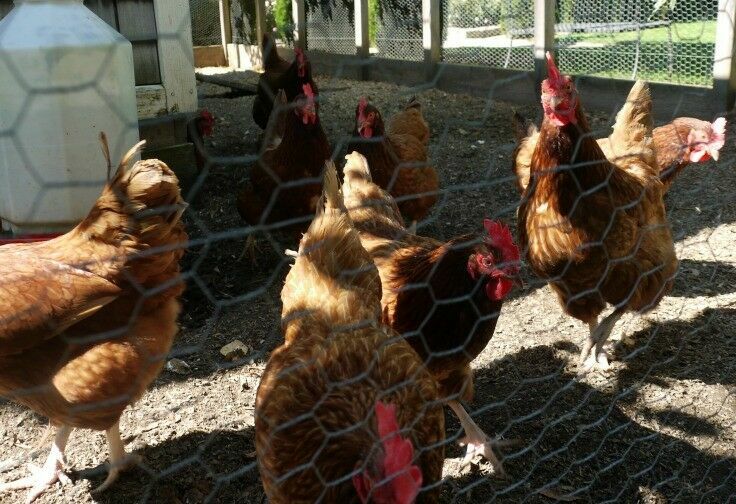 At Wooldridge Creek, their commitment to sustainability is at the heart of everything they do. 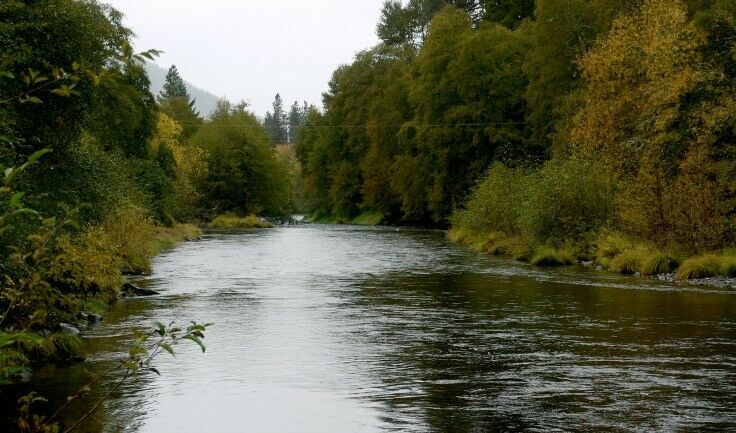 They take their role as stewards of the land seriously, and have maintained certifications for the Salmon Safe and LIVE (Low Input Viticulture and Enology) programs as well as Pacific Power’s Blue Sky Renewable Energy Program for over a decade. They also participate in their local watershed protection association. On a personal note, this was one of the friendliest, most welcoming tasting rooms we’ve visited – I could have hung out there all day! (I went back twice in one month, if that says anything.) 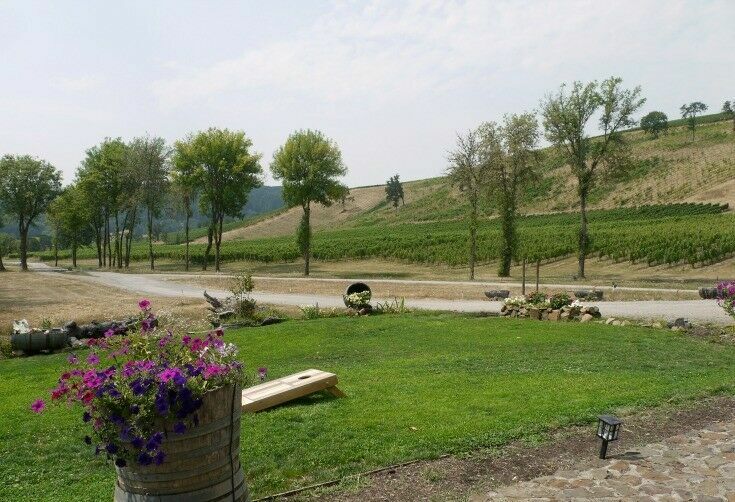 The grounds are beautiful, with broad, sweeping views of the valley; and the entire place has a much less “fussy” vibe than many tasting rooms do… in other words, it very much appealed to my inner hippie. 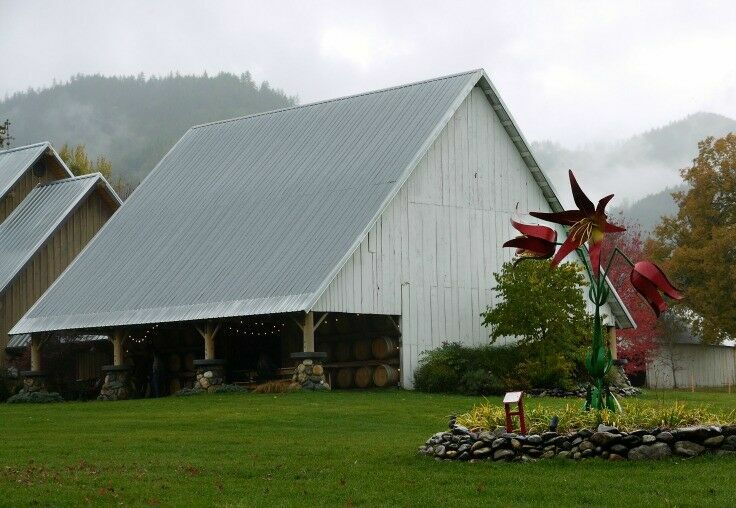 In a move very much in keeping with their role as “stewards of the land,” Wooldridge Creek opened their CrushPad Creamery in 2015, making it Oregon’s first joint creamery and winery. The creamery is located on the winery’s crush pad and offers visitors a chance to view the entire cheese making process. They currently source cow and goat milk from two local organic dairies, and make many styles of cheese, from fresh and soft to aged, hard cheeses. In 2017, Wooldridge made another addition: charcuterie – fermenting local vegetables and curing a selection of meats – to their repertoire. They offer three platters to complement their wine flights: a cheese platter, a charcuterie platter, or a combination of the two. 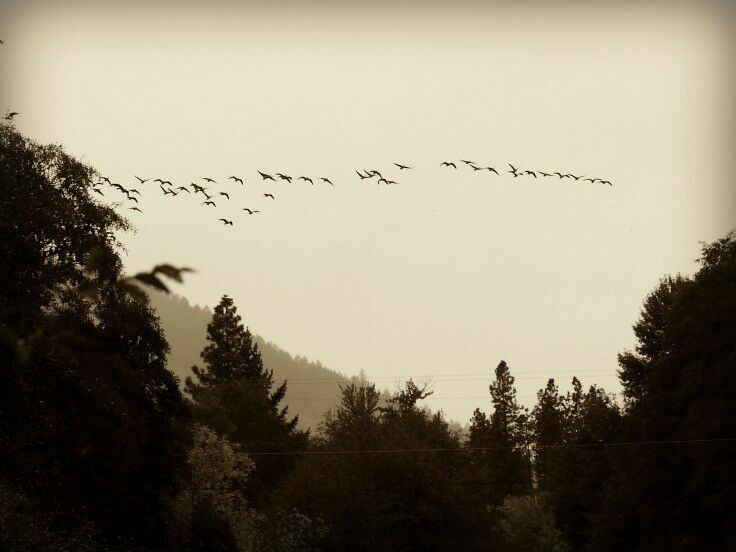 Wooldridge Creek has 56 acres planted in twelve varieties: Cabernet Sauvignon, Merlot, Cabernet Franc, Syrah, Chardonnay, Pinot Noir, Viognier, Sangiovese, Zinfandel, Malbec, Petit Verdot and Tempranillo. 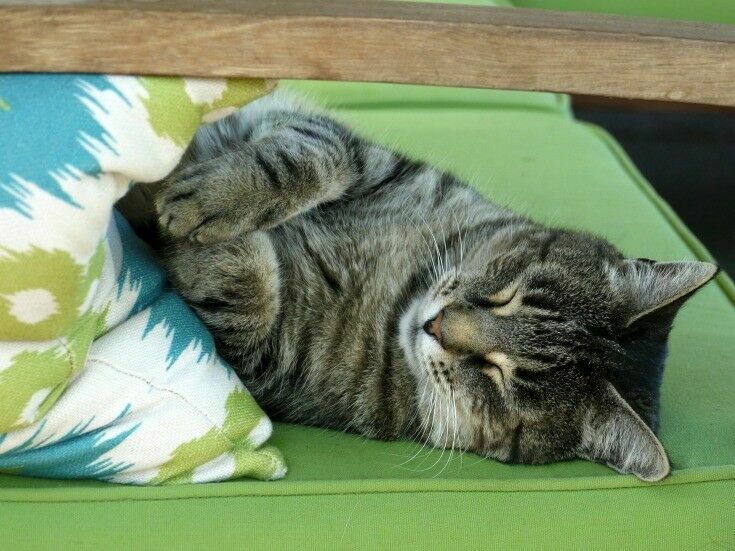 When you visit, be sure to say hello to the winery cat! 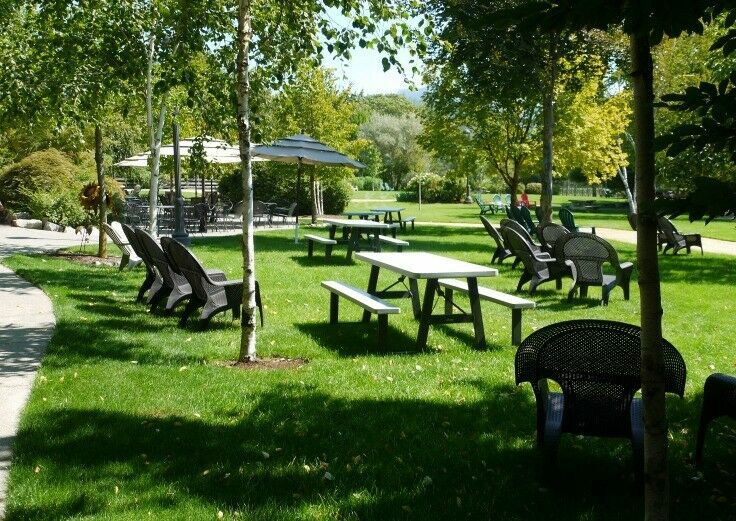 The exceptionally well-kept grounds give visitors plenty of options for relaxing, including bocce ball courts, picnic tables, and a giant chess game. Guests can play while they enjoy a plate of cheeses and a glass of wine… or they can just sit back and take in the view. 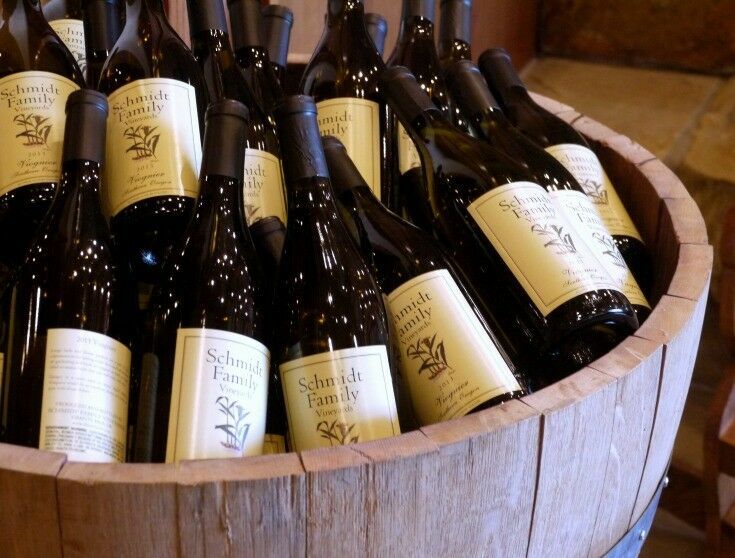 Wine and wine making have always been a passion for Cal Schmidt, and in 2000 with the purchase of the old Bennett Ranch on the fertile Kubli Bench, he and his wife Judy realized his lifelong dream of owning a vineyard. 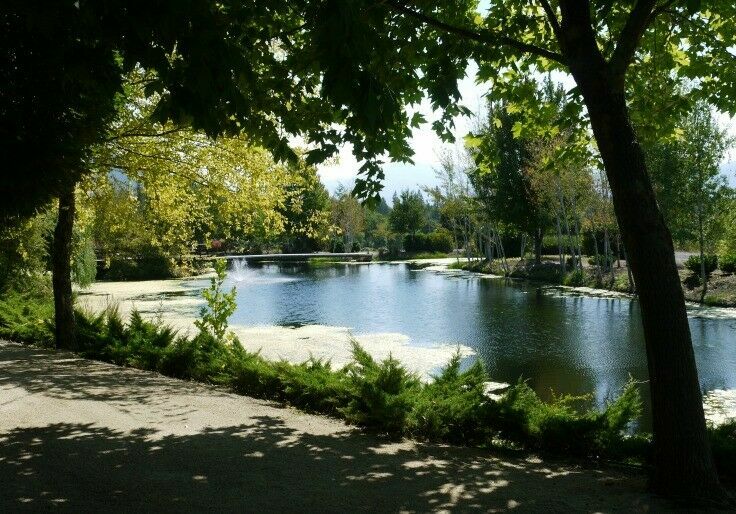 What struck me most about Schmidt Family Vineyards was the care and attention that have been put creating a “complete experience.” In addition to the vineyards themselves, there is a large, picturesque pond, several acres of herb and flower gardens, gazebos, and numerous walking paths for visitors to use as they unwind and enjoy in a beautiful, relaxing setting. 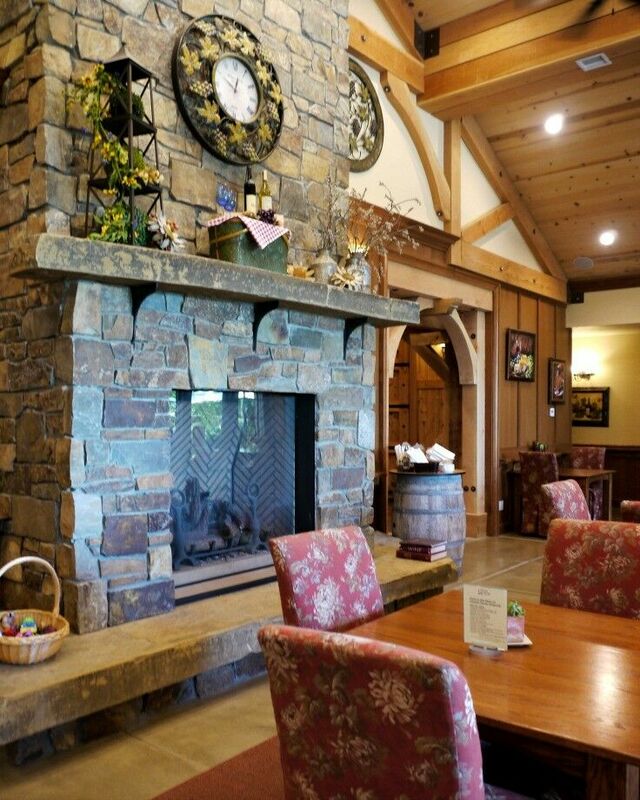 The Craftman-style tasting room at Schmidt Family Vineyards is absolutely stunning. 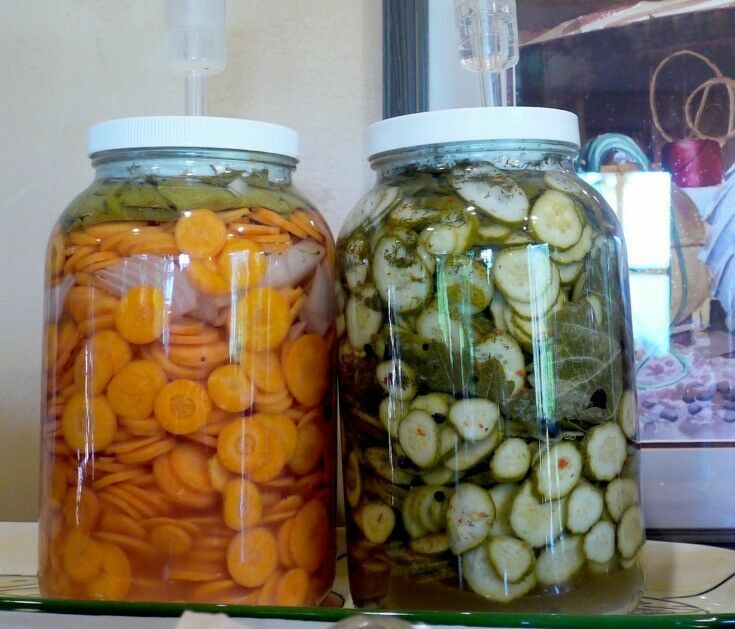 Tasting Room Hours: 7 days a week from 12-5pm. Open on Fridays from 12-8pm. 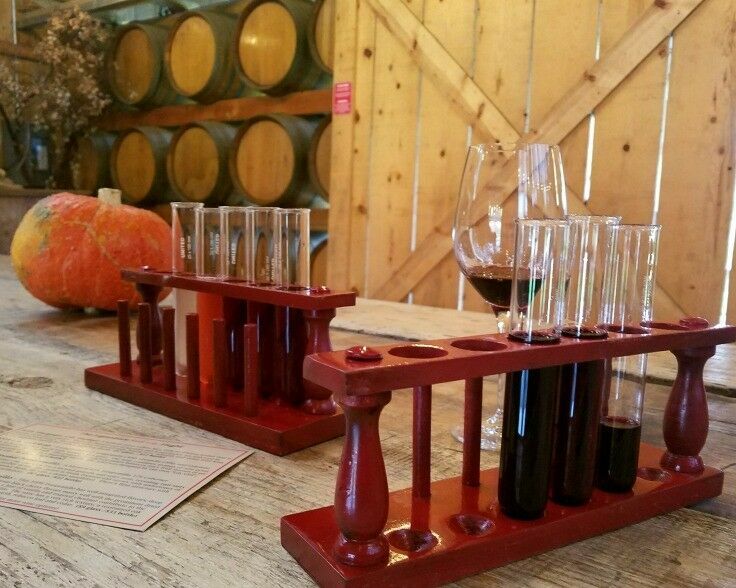 Tasting Fee: $10 for the Vintner Flight & $12 for the Garden Flight (served in test tubes for easily touring the gardens). The Vintner’s Flight is complimentary to Wine Club Members. 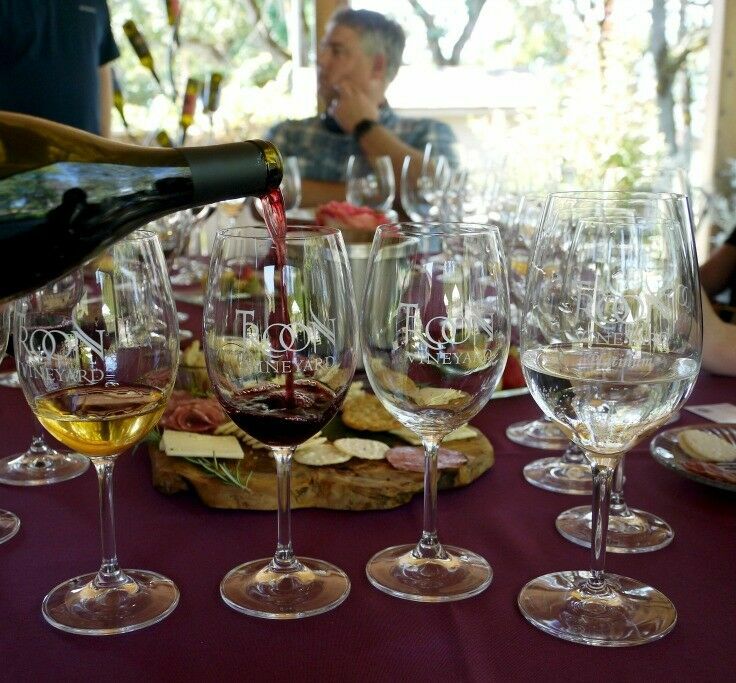 The Garden Flight is 50% off for Wine Club Members. 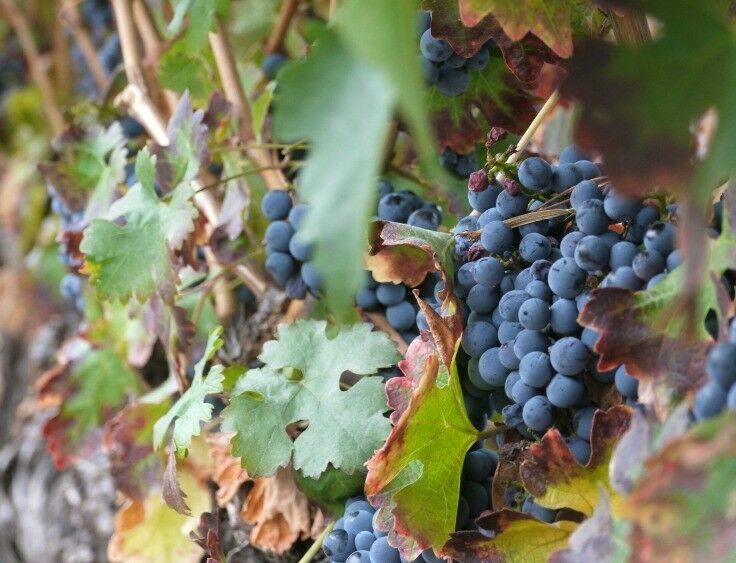 Specialties: Spanish Centric Wines, scenic fall color, and cozy conversation. 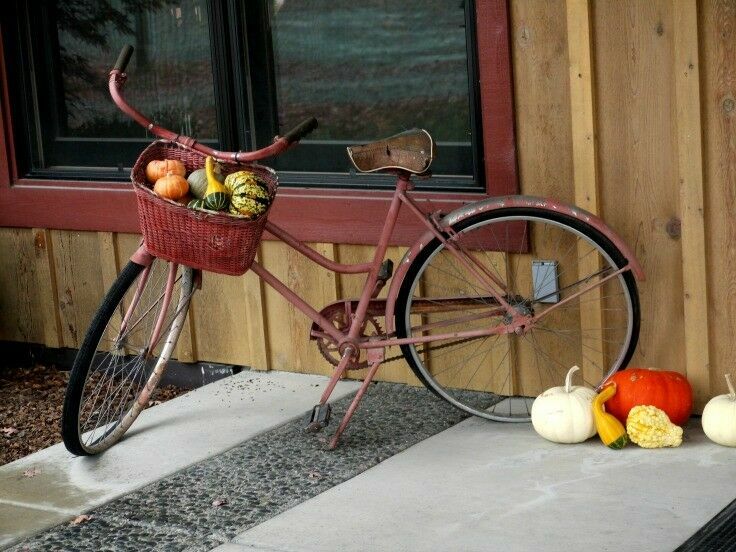 Like all many of the vineyards in the Applegate Valley, you can visit Red Lily Vineyards anytime, but I highly recommend that you put them on your fall wine-tour itinerary when the autumn chill sets the grounds ablaze with vibrant color. 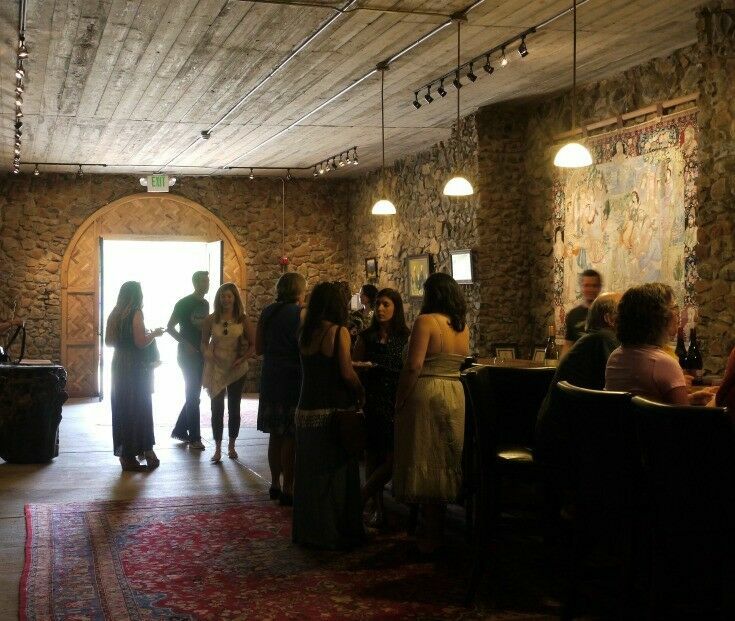 Red Lily’s tasting room is a beautiful example of architectural reclamation. 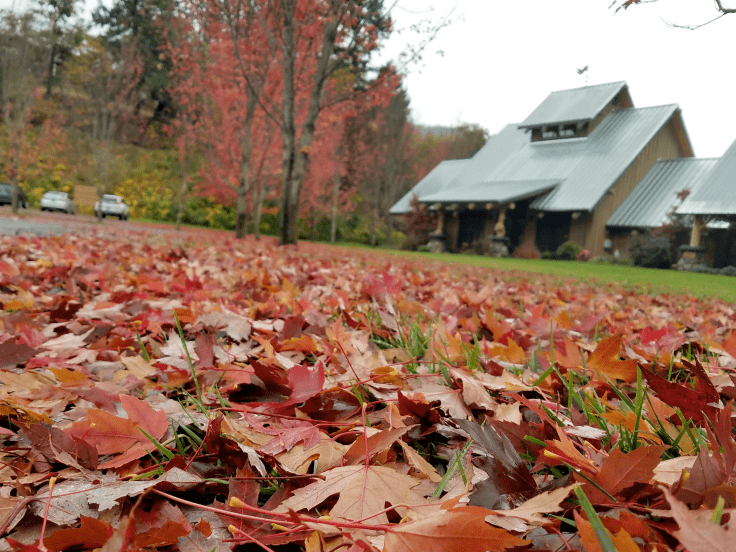 With views of both the valley and the Applegate River, this former feeder barn turned tasting room offers guests both inside and outside seating, an outdoor fireplace, and outdoor heaters to stay warm and cozy. 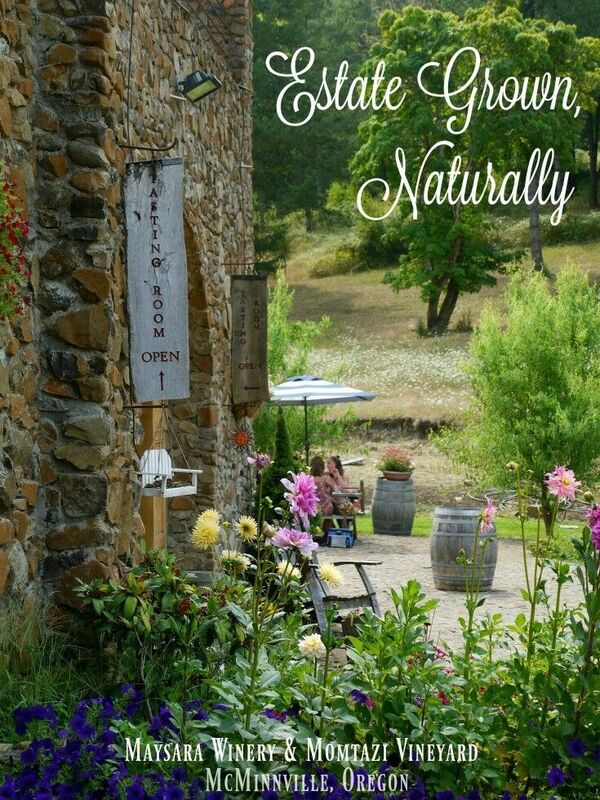 When we visited, we found the prices to be reasonable and the tasting room staff extremely helpful. Wine flights are served in a test-tube rack, which initially seemed a bit strange, but as it turned out, made a very practical presentation. 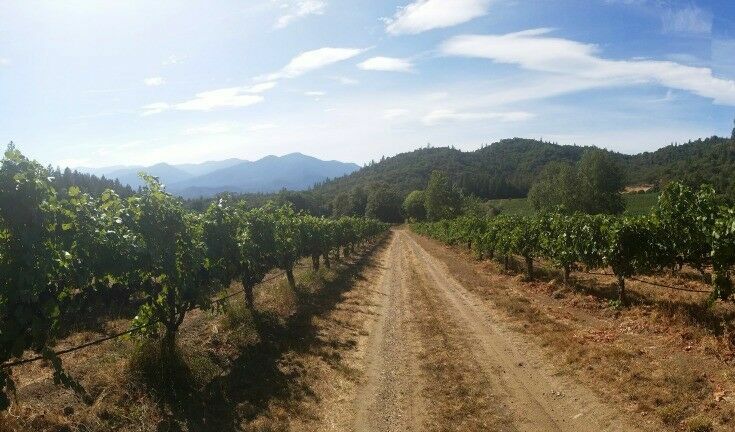 Varietals produced by Red Lily Vineyards include Albarino, Grenache, Tempranillo and Touriga Nacional. 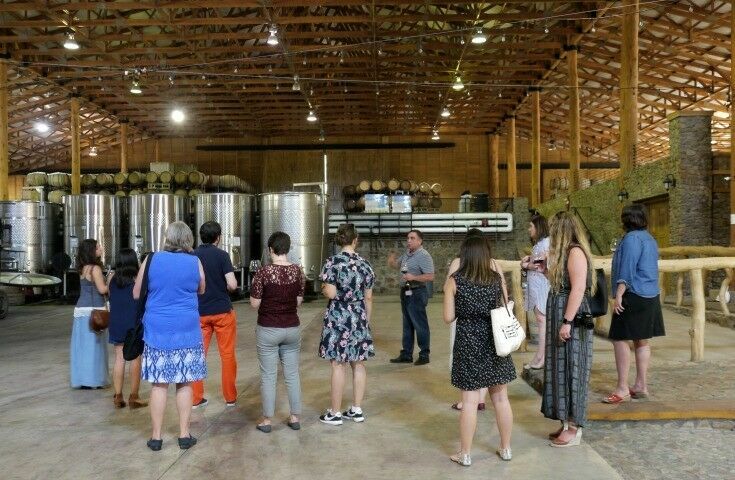 Disclosure: My visit to Wooldridge Creek, Schmidt, and Troon Wineries, including tastings, were complimentary as part of a Travel Oregon press trip. As always, all opinions and images are my own. This post may contain affiliate links, which means we may receive a commission if you click a link and purchase something that we have recommended. While clicking these links won’t cost you any extra money, they do help keep this site up and running, and at the same time allow us to keep traditional advertising to a minimum. Please check out our disclosure policy for more details. Thank you for your support! Knowing what to expect and being prepared will make all the difference when you attend the Newport Seafood & Wine Festival. 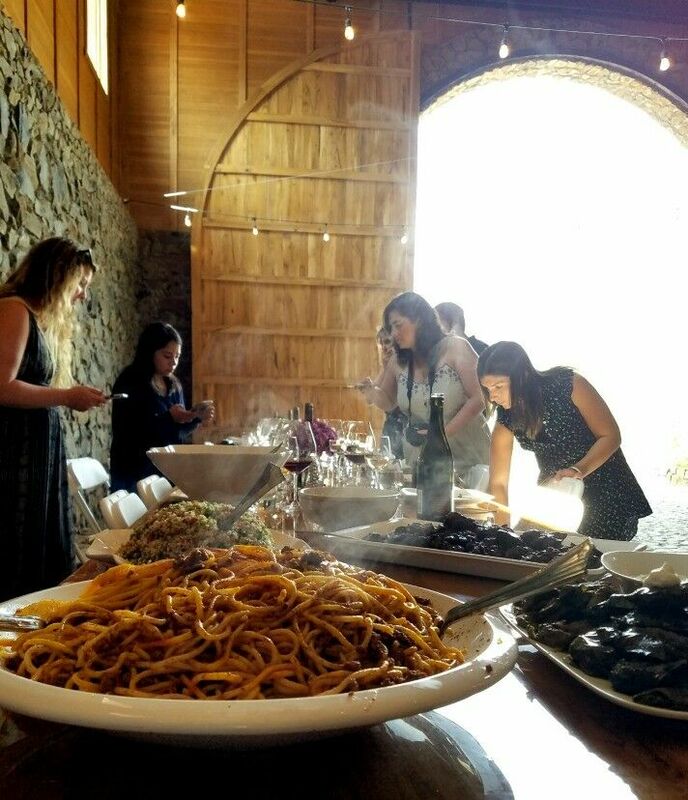 A few years ago while attending a casual dinner gathering of Portland food and wine bloggers in Portland, I happen to mention that I had just returned from a weekend at the coast. True story, folks. Be prepared. Jenny and I met these enthusiastic ladies while waiting in the shuttle line. They attend the Festival every year together to celebrate their friend’s birthday. It all started out like an adventure waiting to happen. My BFF Jenny and I packed up the car for much needed a girls’ weekend at the beach, where we planned to spend our time tasting some of the best wines around and eating piles of delicious seafood. Well, we definitely made a memory – no question about that – but we also got an clear-cut reminder that, like Disneyland on a hot August afternoon, expectation and reality are not always the same thing. That said, let me be clear: the point of this post is not to discourage you from attending the Newport Seafood & Wine Festival: quite the contrary! It is my hope that this post will give you the information you need so that, when you go, you can have a great time; and (most importantly) avoid having any big, unwelcome surprises along the way. In other words, this is the post I wish I had read before I went. 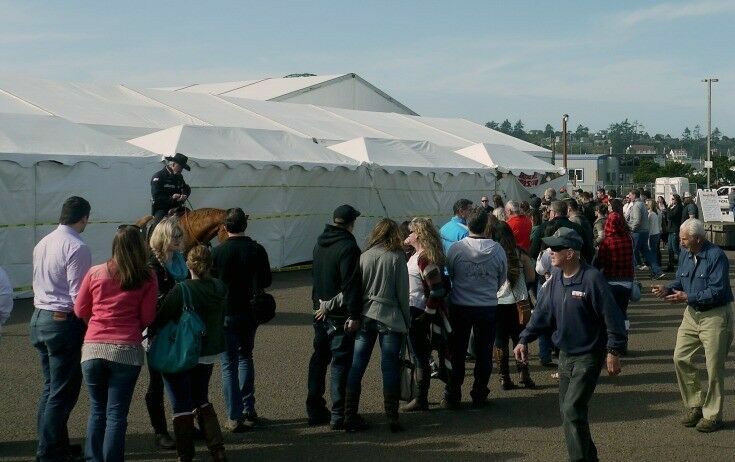 Every February since 1978, the Newport Seafood & Wine Festival in Newport, Oregon has attracted visitors from around the world. 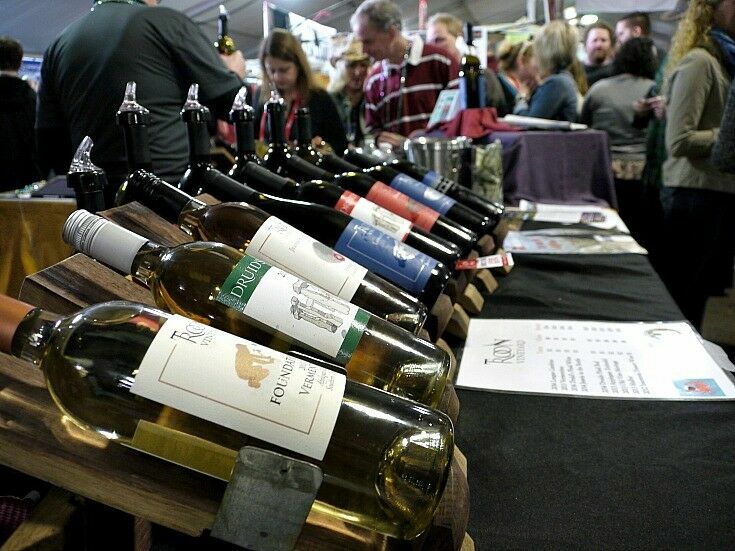 At the Festival, Pacific Northwest wineries pour their finest wines, culinary professionals serve up delectable seafood creations, and local artists and craftsmen showcase a variety of fine art, sculptures, photography, pottery, and jewelry. Knowing what to expect and being prepared will make all the difference in your experience. 1. Book your stay in Newport early. 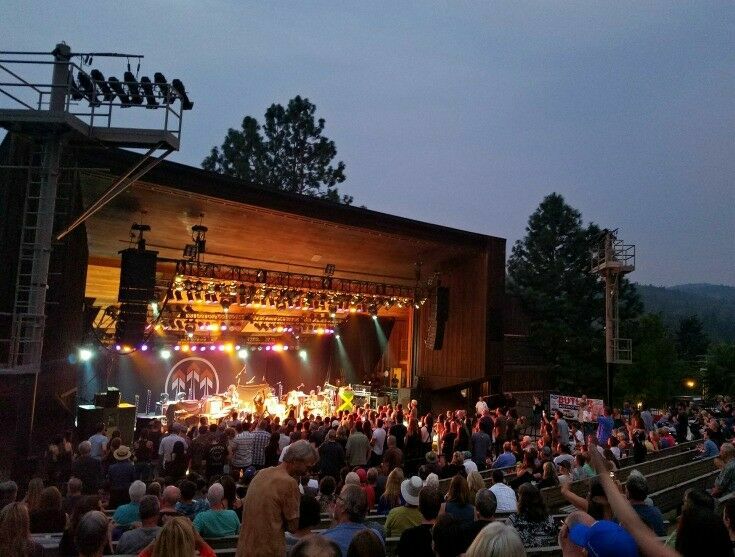 Each year, the Festival draws some 25,000 additional people to this coastal community of 10,000, making overnight options scarce, so if you want to stay in town, be sure to plan ahead. Or, better yet, plan your overnight stay in one of the many nearby coastal towns. Maybe it’s just my imagination, but Newport overnight accommodations during the Festival seem significantly more pricey than they are other times of the year. (Whaaa?!?!) You may find a better deal by staying 20 or 30 minutes north or south of Newport. 2. Purchase your tickets online to save. You can save between 10% and 20% by purchasing your tickets online. Note that Saturday entrance is by E-Ticket only. There is NO GENERAL ADMISSION on Saturday. Standby may be available after 1pm depending on capacity; however, standby tickets are considerably more expensive. 3. Eat a good meal before you go. 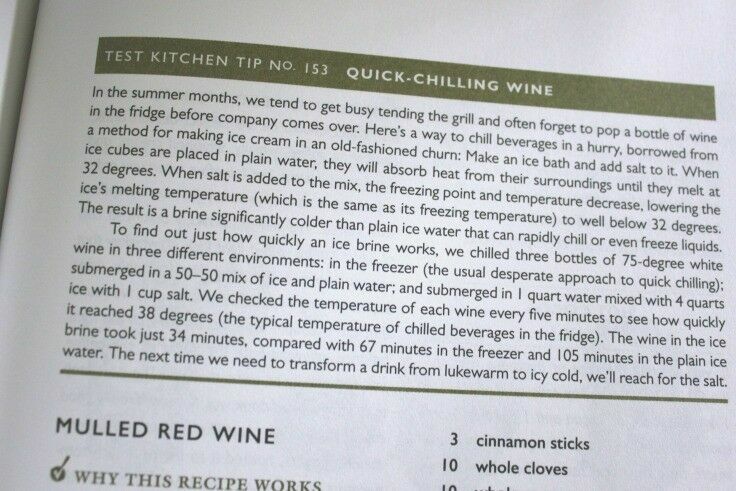 This is just common sense, especially if you plan to do a lot of wine tasting. You probably want to avoid spicy or heavily seasoned food in order to keep your taste buds neutral, but it’s a good idea to have something in your stomach. 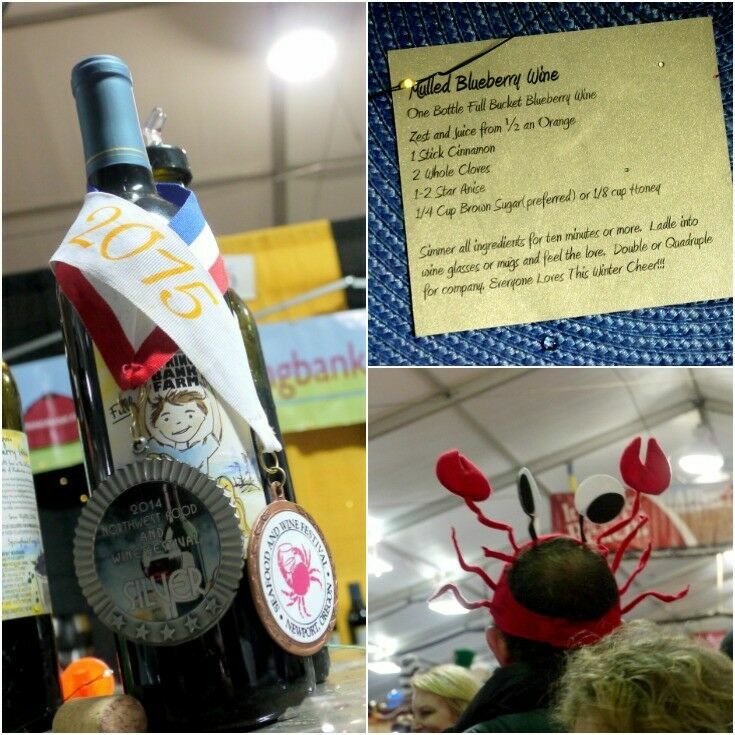 Speaking of food, I think that the single biggest disappointment about the Festival for me when I attended was due wholly to my incorrect perception that because title of the Festival was “Seafood & Wine,” that there would be a balance of, well, seafood and wine. Logically, what followed in my mind was that I would have many luscious seafood options from which to choose for a midday meal. The reality was, not so much. From my perspective (and I’m sure some would disagree) this Festival is all about the Wine: the seafood is just a nice opening act, and an overpriced one at that. With that said, the food vendor list for this year’s festival seems to have significantly expanded since we attended, so it might be a bit more balanced now. 4. Take advantage of the shuttle service. 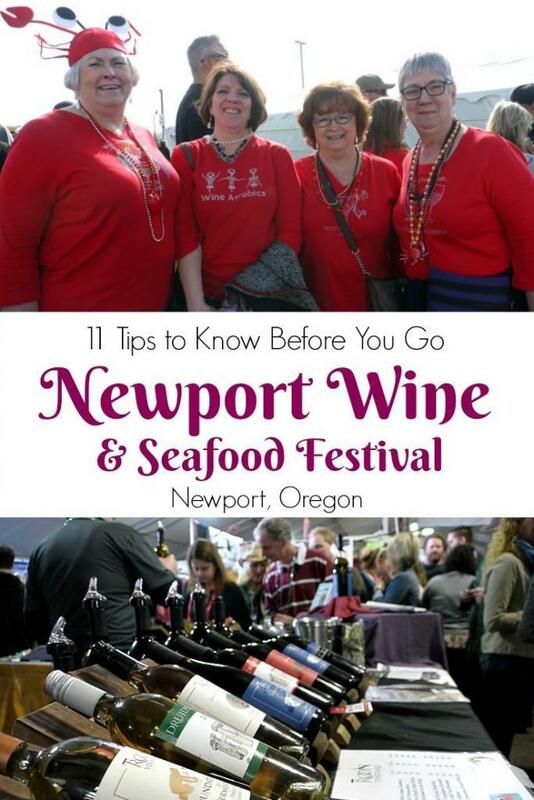 The Newport Seafood & Wine Festival provides a FREE bus shuttle to all patrons of the Festival. The shuttle stops at many of the local hotels, motels and popular Newport neighborhoods. Shuttles stop running 1 hour after the closing of the Festival. On Saturday the hours are extended for service to area restaurants. Even if you are staying a ways out of town, I suggest parking at one of the shuttle stops and taking the shuttle bus to the actual event location, as parking there can be a significant challenge much of the time. There are also many private groups that obtain a license to operate as a temporary cab service through the City of Newport. These cab services are available throughout the Festival weekend in addition to the regular cab companies in Newport. 5. Go early and leave early. At peak times of the day (particularly on Saturday) there can be a bit of a wait to get in, so be prepared to chill in line for a little while. (And “chill” you will! Remember, this is the Oregon Coast in February, folks.) The upside to this is that you will have the opportunity to meet some truly interesting characters. The best days to go to avoid the college partiers are Thursday night or Sunday, the later being the most “adult” day of the Festival. Sunday is also a good day for finding deals, as vendors don’t want to tote all that wine back with them. 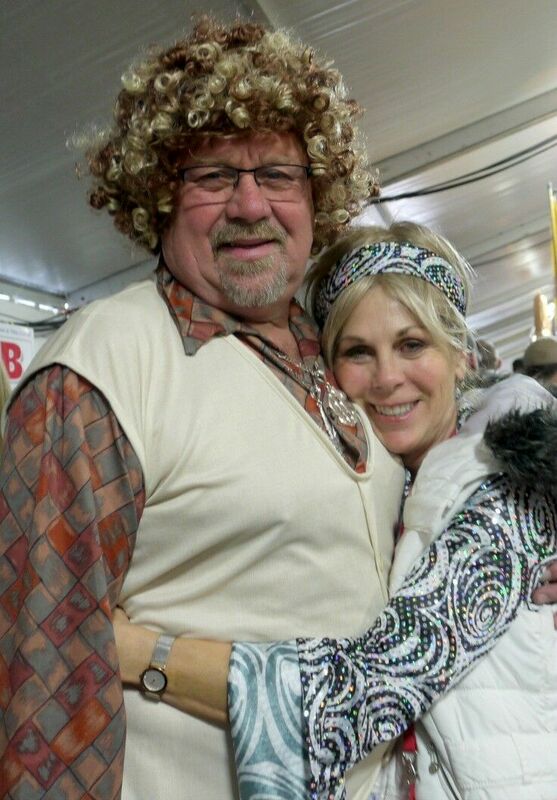 This couple, like many, dressed up for the occasion. 6. Do not drink all the wine. [Read: Don’t be a jackass.] At one point while Jenny and I were threading our way through the crowds, it seemed as though wine glasses were falling to the ground around us like plates at a Greek wedding, due mostly to the fact that their owners had lost the ability to hold onto a glass properly. Each time a glass popped and shattered on the asphalt floor, individuals in the nearby crowd expressed one of two distinct reactions: (1) clapping, cheering, and general appreciation for the glass owner’s achievement of apparent inebriation, or (2) head-shaking and eye-rolling at the glass owner’s achievement of apparent inebriation. Personally, and at risk of sounding old and judgy, the truth is, if you drink all the wine, you will end up looking like a jackass to at least half the crowd. If you’re cool with that, great. Just don’t say I didn’t warn you. Mulled blueberry wine, made from a novelty wine from Springbank Farm in Lebanon, Oregon was one of my favorite things at the Festival. It was especially welcome on a crisp February afternoon. 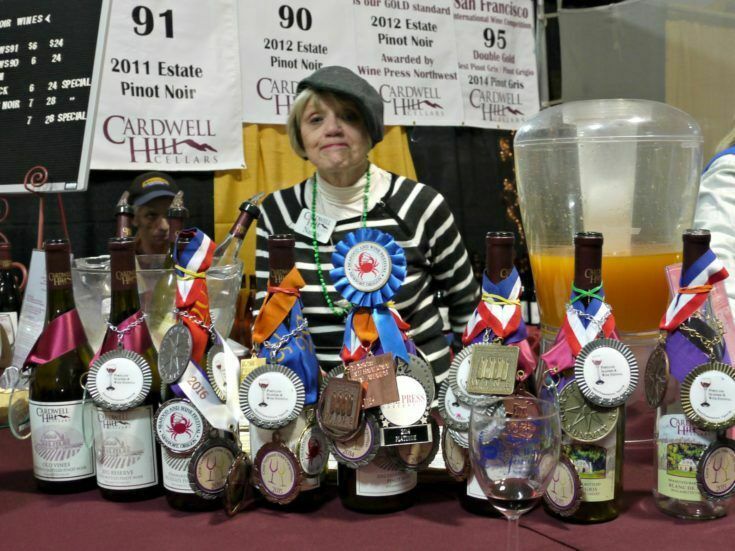 This Cardwell Hill Cellars vendor was very friendly, and such a good sport for posing for my “exhausted vendor” pic. 8. You probably don’t want to take your teetotaling friends. I have a lot of friends who don’t consume alcohol under any circumstances, and I attend many food events at which alcohol is served to which I would feel completely comfortable taking them… but this ain’t one of ’em. 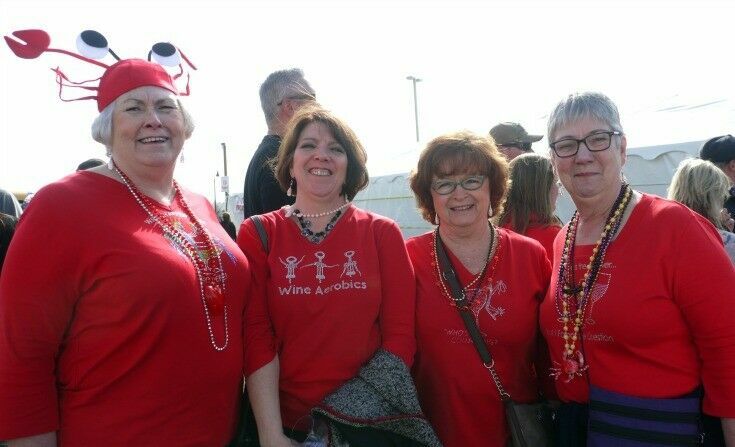 The focus of the Newport Seafood & Wine Festival is on Wine first and foremost, and as someone who abstained for much of my adult life, I can tell you, this event just isn’t geared for the non-imbibing demographic, at all. In addition to wine and seafood, there are a number of artisan & crafter booths at the Festival, and this was one of my favorites! 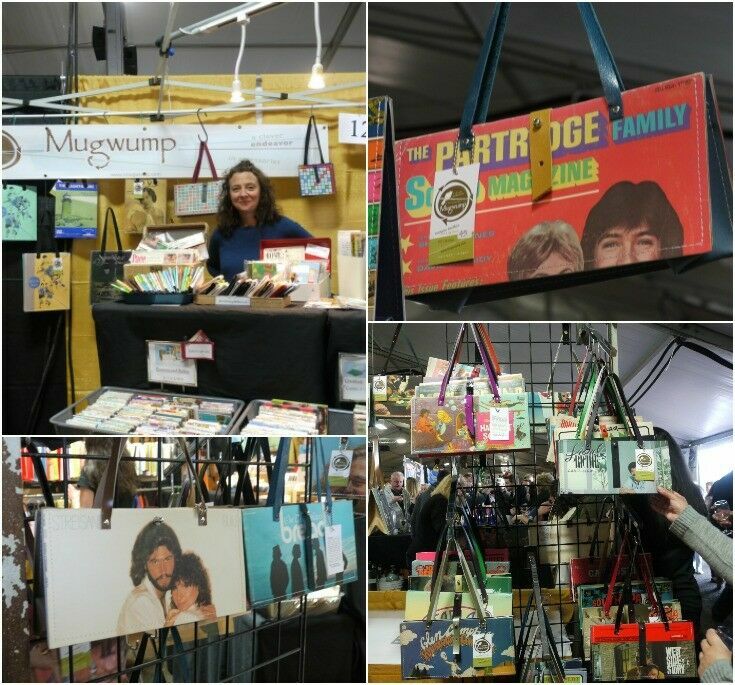 Mugwump designs & creates handbags, wallets, & other fashion accessories using reclaimed/recycled materials. 9. 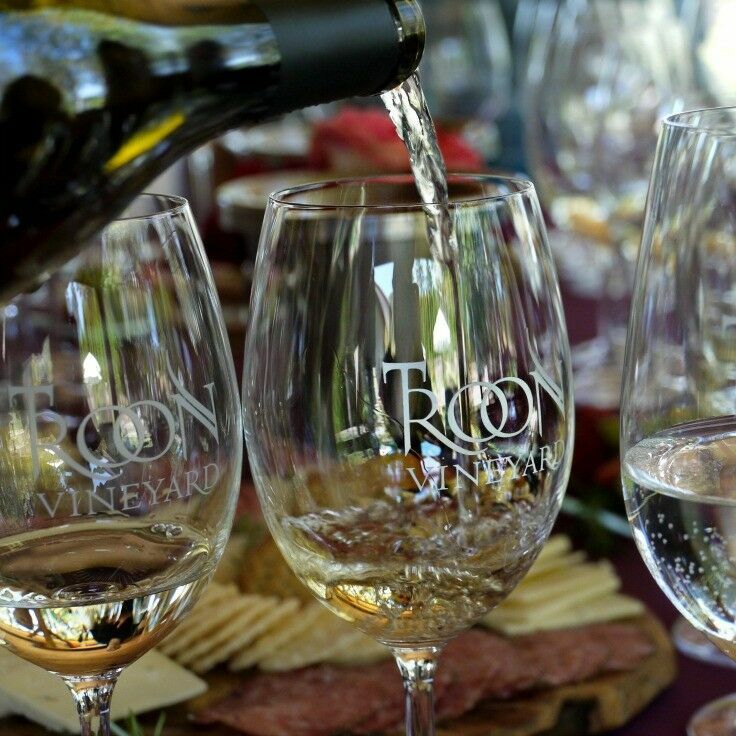 Actual wine tastings are NOT INCLUDED in the price of your ticket. 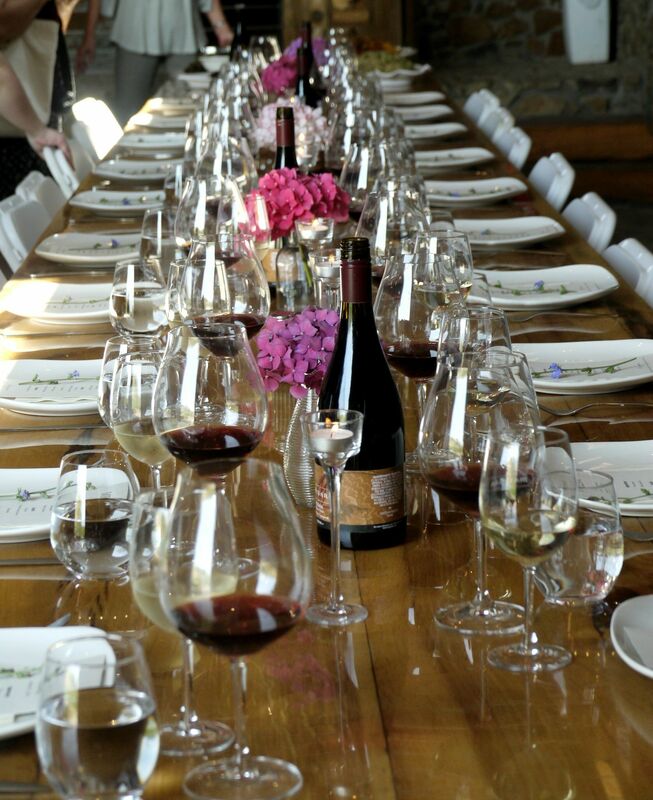 If this is your first large-scale wine tasting event, this may come as a surprise. If you plan to do a lot of tasting, come prepared with a pocket full of small bills. 10. Wine awards are (apparently) like soccer trophies: everyone gets one. However, (and I’m just guessing here) not all awards are created equal. 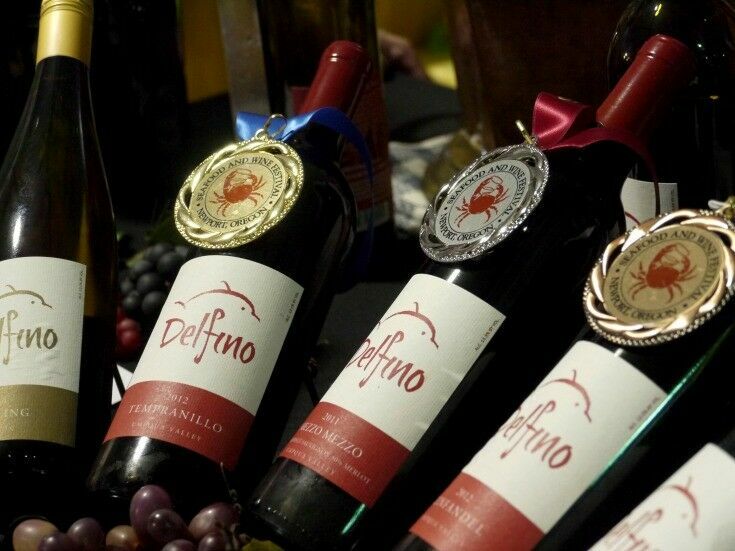 Now, I’m no wine expert by any stretch, especially when it comes to “wine awards.” All I can tell you is that practically every bottle I saw on display had some kind of ribbon or medal hanging around its neck. 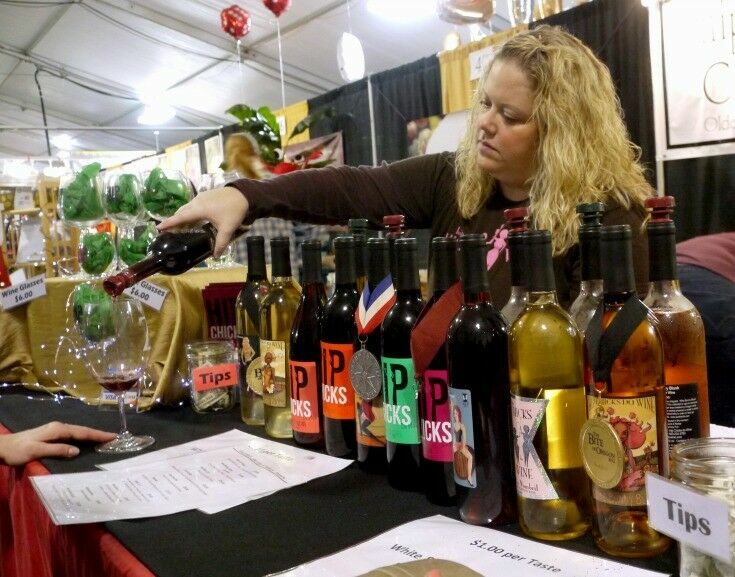 The Newport Seafood & Wine Festival hands out Gold, Silver, Bronze and Best-In-Show awards, but beyond that there are tons of wine awards on display from countless other competitions. 11. There will be at least four times more people there than you imagine. If you are one of those people like I am (INFP here) who find crowds a little intimidating (or terrifying), I strongly urge you to avoid going on Saturday at all. This is the busiest day of the Festival (followed closely by Friday evening) and the one that attracts the most “revelers” as well. The best time for crowd-shy folks is Thursday night (which is also the media night), or early in the day on Friday or Sunday. 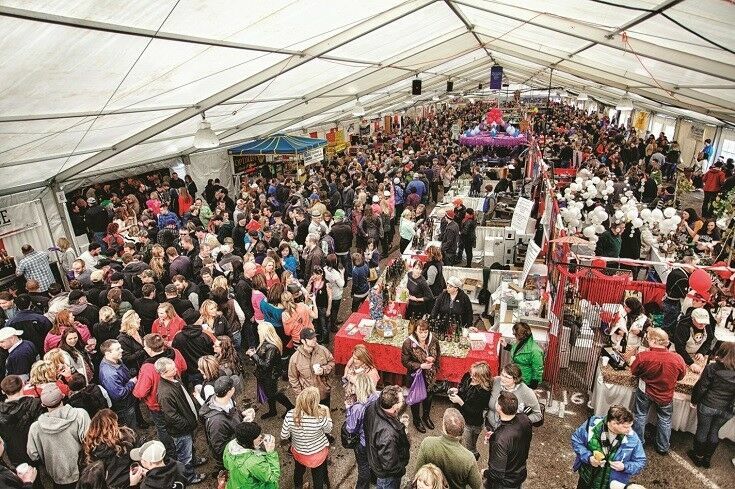 Have you ever attended the Newport Seafood & Seafood Festival? (Or any large-scale wine festival?) Share your best advice or tips in the comments below. 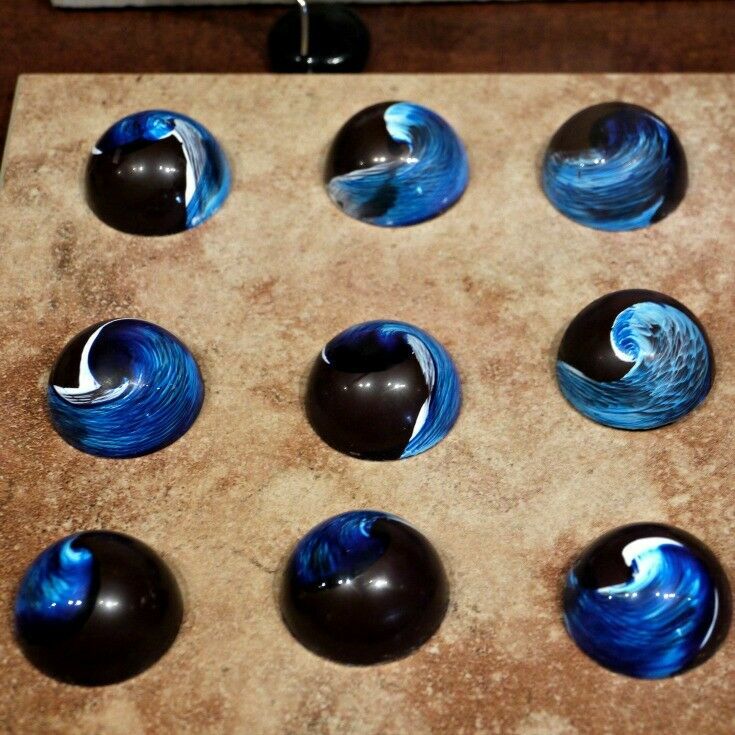 In my last post, I introduced you to the Southern Oregon Artisan Corridor, a small alliance of artisan culinary shops in Central Point, Oregon, and shared our experiences at Lillie Belle Farms with Jeff Shepherd and his amazing chocolates. Today, it’s all about the Cheese. 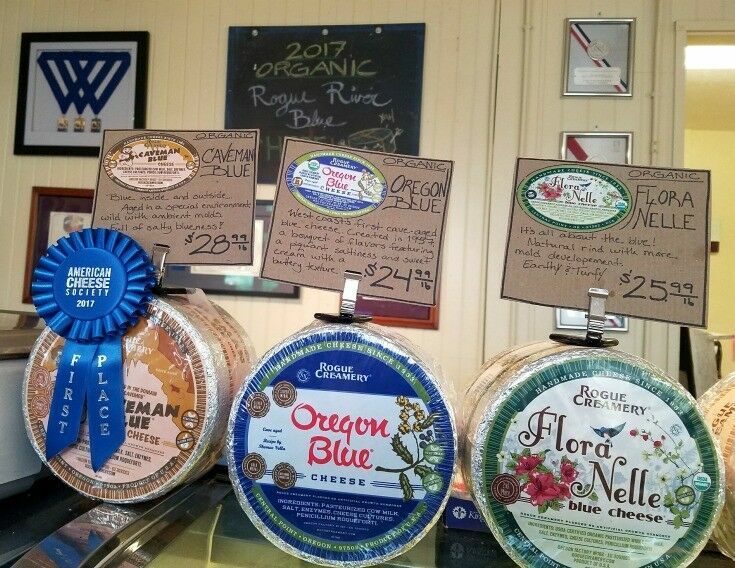 … creamy, salty, savory, delicious, handcrafted, award-winning, internationally-acclaimed Rogue Creamery Blue Cheese. For many years, I erroneously thought that blue cheese, Roquetfort, Gorgonzola and the like were distinctly different cheeses. And they are… but they aren’t. 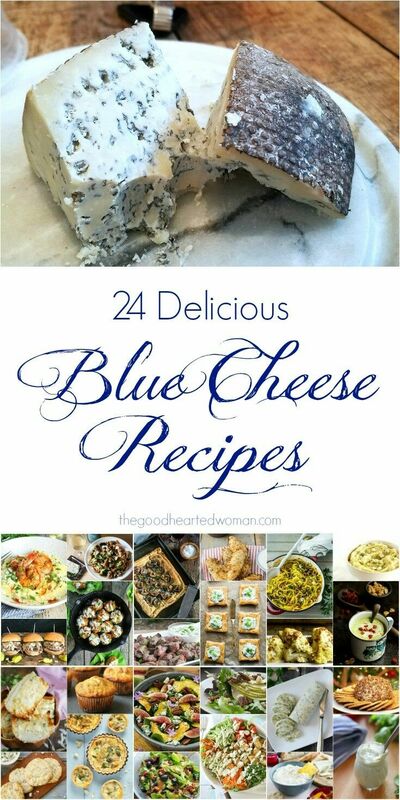 Like Swiss- and cheddar-style cheeses, there are a wide variety of blue cheeses, each with its own unique flavor and textures, but they can ofttimes be used interchangeably in recipes. So before we go any farther, let’s take a moment to discuss what blue cheese is. Blue cheese is most often made from cow, sheep, or goat milk. Blue cheese is made by culturing milk with Penicillium, a type of mold. Different blue cheeses are cultured in various ways, using unique strains of Penicullium, giving them their distinct flavor, texture, and aroma. In the European Union, many blue cheeses (e.g., Roquefort, Gorgonzola and Stilton) are protected, and can bear their name only if they have been made in a particular region. Cabrales – Traditionally made from mixing goat and sheep’s milk together, Cabrales has a strong, spicy flavor. Danish Blue – This strong blue cheese is creamy, with a semi-soft texture. Dorset Blue Vinney – This English blue cheese is made with unpasteurized, skimmed cow’s milk, and has a hard texture, a crusty outer layer, and a strong aroma and taste. Gorgonzola – Made with either cow or goat’s milk (sometimes both), Gorgonzola is a firm, creamy cheese with a salty and often slightly sweet taste. 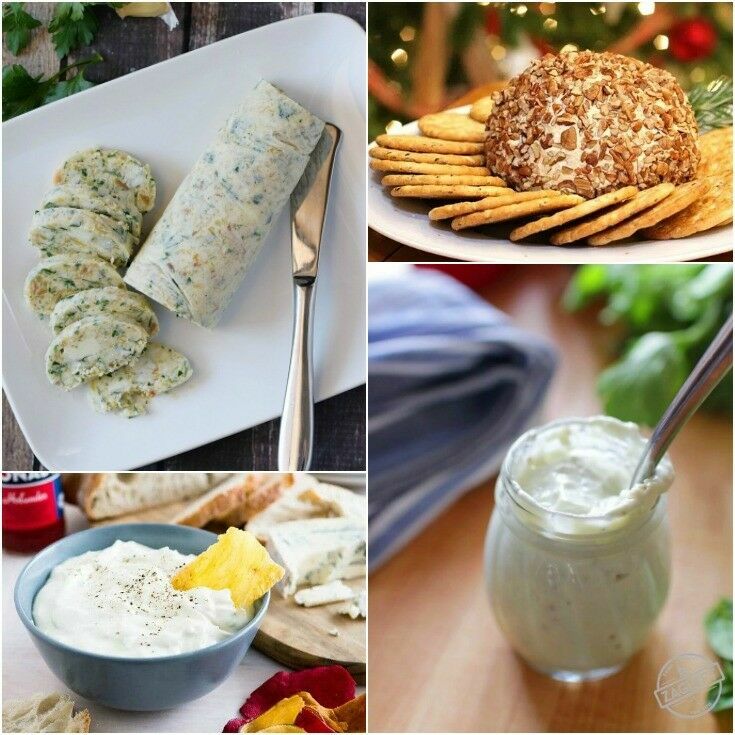 Roquefort – Famously green-veined, Roquefort has a tangy, salty flavor with sweet undertones. 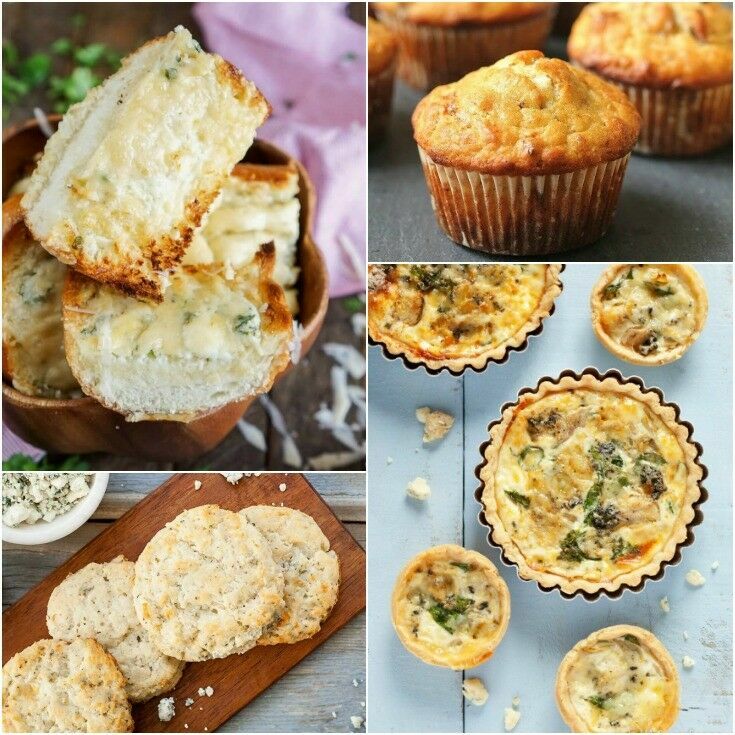 Stilton – This semi-soft cheese is made from unpasteurized cow’s milk, and has a strong aroma and outstanding flavor. There’s something comforting and wonderful about the rustic feel of a real, honest-to-goodness (emphasis on the goodness!) cheese shop, and the Rogue Creamery is about as honest a cheese shop as they come. 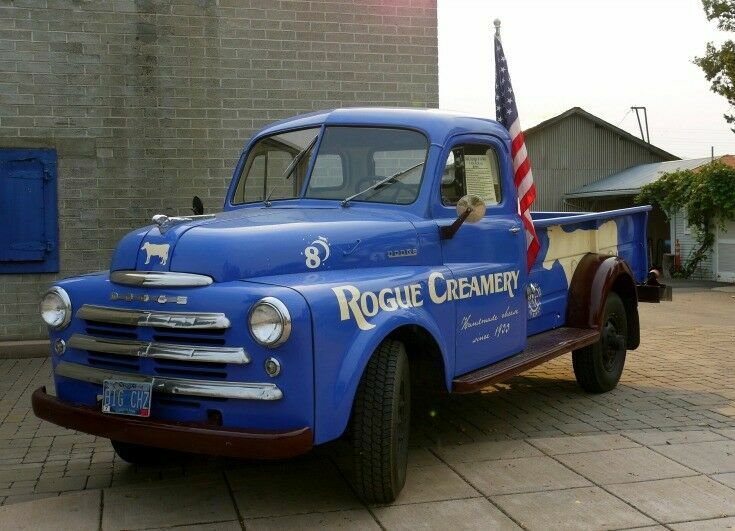 Founded in 1933 at the height of the depression, Rogue Creamery began producing blue cheese in 1954. 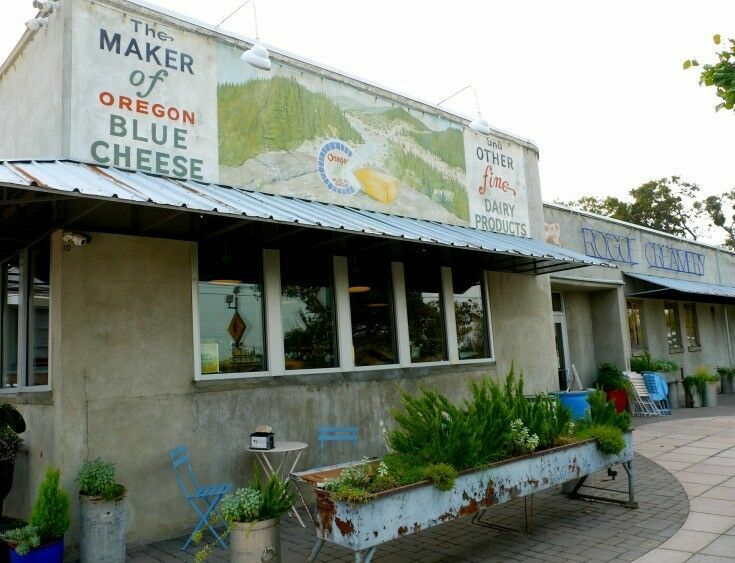 Today, they continue to draw both inspiration and resources from Southern Oregon’s Rogue River Valley, and offer award-winning varieties of outstanding handcrafted blue cheese, cheddar cheese, and TouVelle. Step inside to sample cheeses to your heart’s content. Hungry travelers can order one of their crazy-good panini-style grilled cheese sandwiches, prepared with more than a generous amount of cheese. 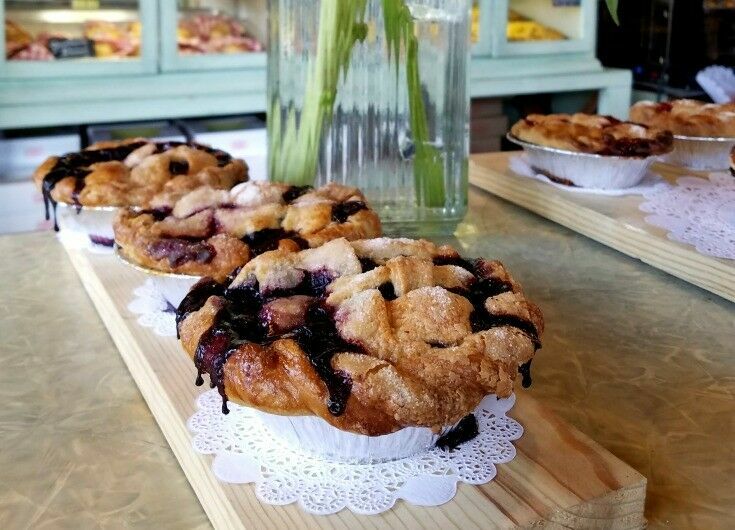 A great place to pack a perfect picnic, Rogue Creamery also offers a carefully curated selection of deli items, crackers, fruit, beer, and wine, as well as local artisan jams, jellies and sauces. The staff at the shop is helpful and knowledgeable, and will be more than happy to help you with your selections. PRO TIP: There are always samples available, but if something you want to try isn’t out, all you need to do it ask. Smokey Blue: Referred to in-house as “Beginner Blue,” this smooth, smokey blue packs in all of the flavor (and then some) without the harsh, bitey quality of some blue cheeses. This classic Roquefort-style blue cheese is cold smoked sixteen hours with Oregon Hazelnut shells, resulting in a sweet, creamy, smoky flavor. It crumbles well, and is “easy to eat” as blue cheese goes, and pairs well with well-rounded “food” wines that are on the fruity side and lighter on tannins and acidity. LaDiDa Lavender Cheddar: I know – it sounds weird, but Mr B and I both love this uniquely floral cheese. 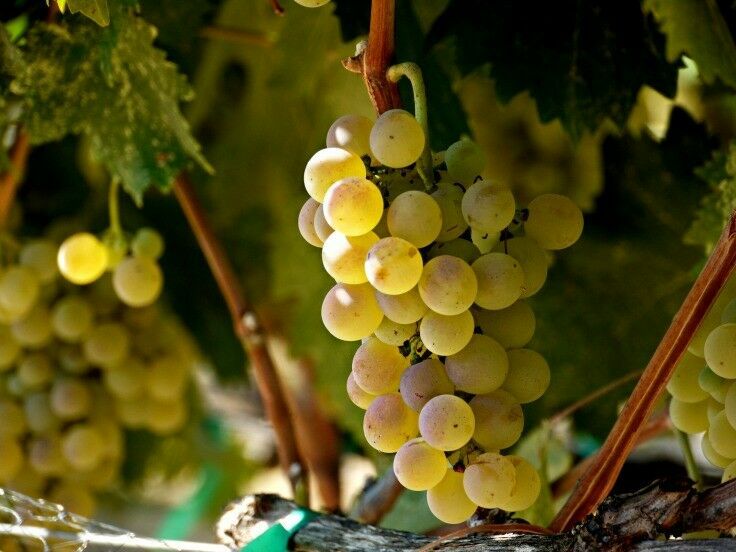 LaDiDa would be perfect on a dessert tray with chocolate or scones, and paired with a light dessert wine. Caveman Blue: Full-bodied, buttery, and AMAZING! 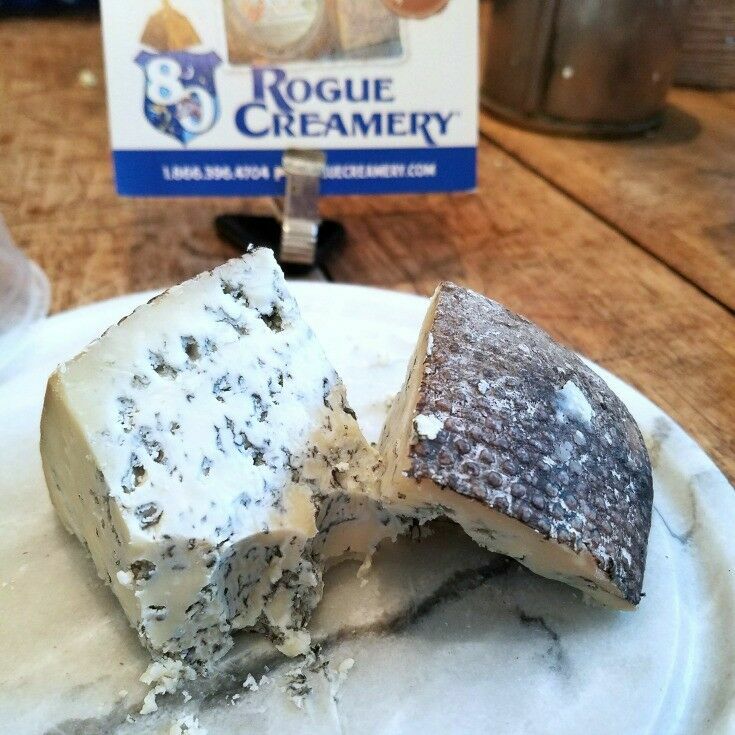 Rogue Creamery uses a unique aging environment to create this golden-hued blue that tastes of sweet, fresh buttermilk with hints of tropical fruit. Caveman’s earthy undertones pair well with a wide range of beverages, from bold reds to sweeter desert wines to full-flavored Stouts. Blue Heaven (Powdered Cheese): Blue Heaven is a proprietary blend of Oregon Blue, Oregonzola, Crater Lake Blue and special reserve blue cheeses. Perfect for sprinkling on salads, breads, popcorn, nuts, and anything else you can think of. PRO TIP: Not a fan of dry, tannin-rich red wines? Me either. But next time you have the chance, try some with a bite of blue cheese. You may be pleasantly surprised (as I was) to discover that the pairing opens up whole new venues to you. Tannins literally bind to the cheese’s protein and fat, measurably softening the astringent qualities of the tannins, and making the entire tasting experience smoother in the process. Blue Cheese is an amazingly versatile cheese; equally perfect on a fruit and cheese plate or as a stand-out ingredient in your next meal. Here’s a little Blue Inspiration  from some of my favorite bloggers. 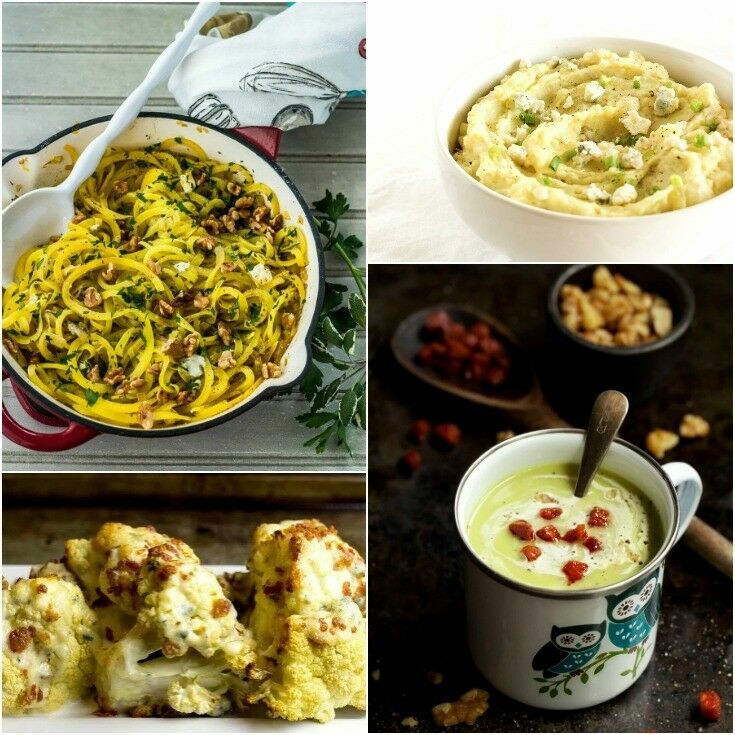 ** Recipes are pictured in order, clockwise from the top left corner of each image. 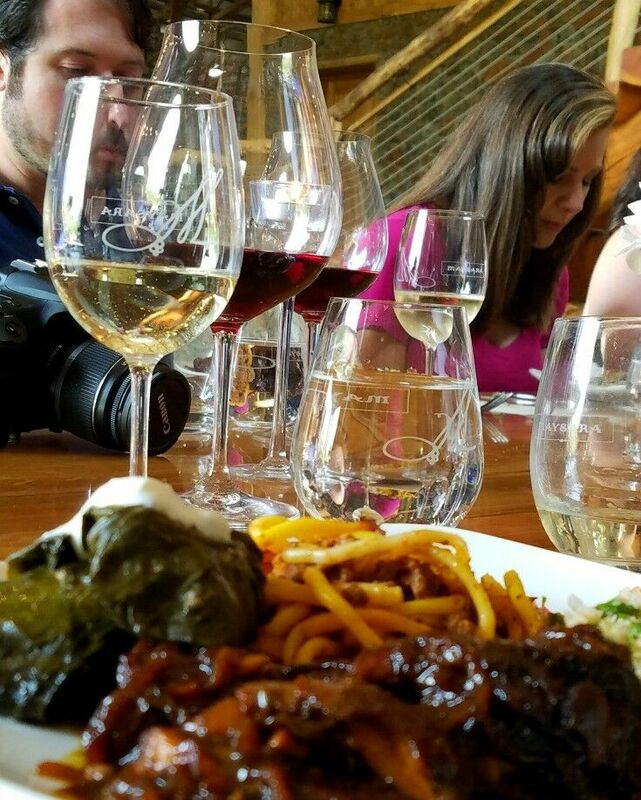 Disclosure: My first trip to the Southern Oregon Artisan Corridor was as part of the #TrailsToFeast Travel Oregon press trip. As always, all opinions and photos are my own. 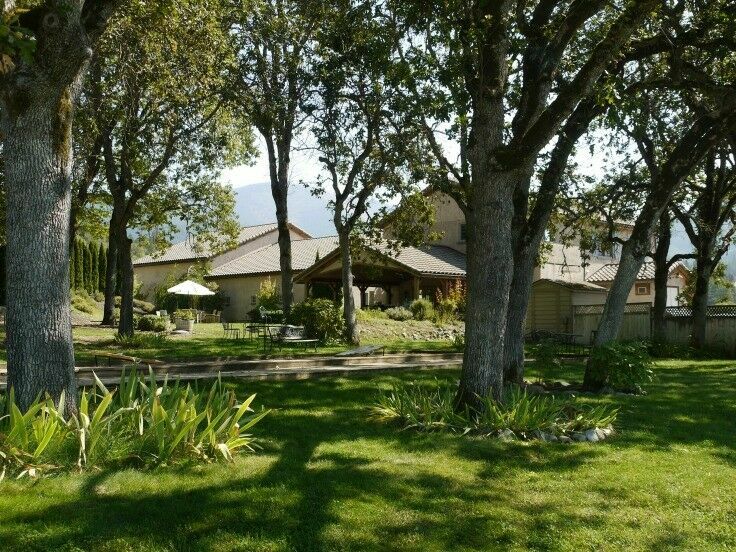 From their stewardship of the land to the award-winning wines they produce, Maysara Winery and Momtazi Vineyard stands as the legacy of a gracious family. 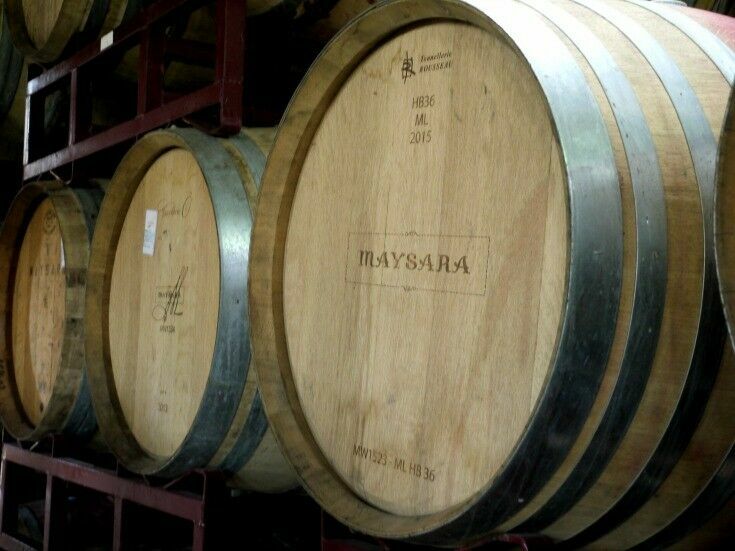 If there is one thing that stands out about visiting Maysara Winery, it is the warmth and passion radiated by the Momtazi family who created and run it. 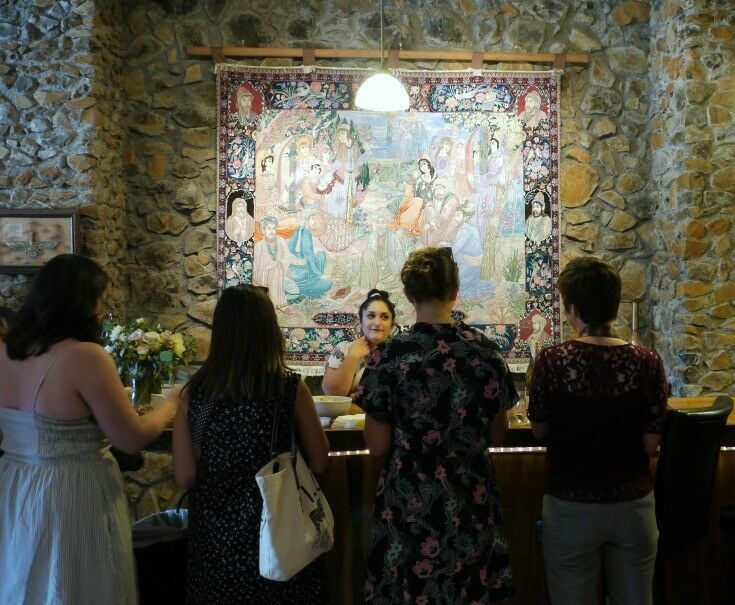 From the first moment Hannah Momtazi greeted us from behind the counter in the Maysara Winery tasting room, our gathering felt more like a reunion of friends than a press tour. We were welcomed with engaging conversation, generous pours, a delicious charcuterie tray, and Flora Momtazi’s homemade baba ganoush, which I could have eaten all afternoon. 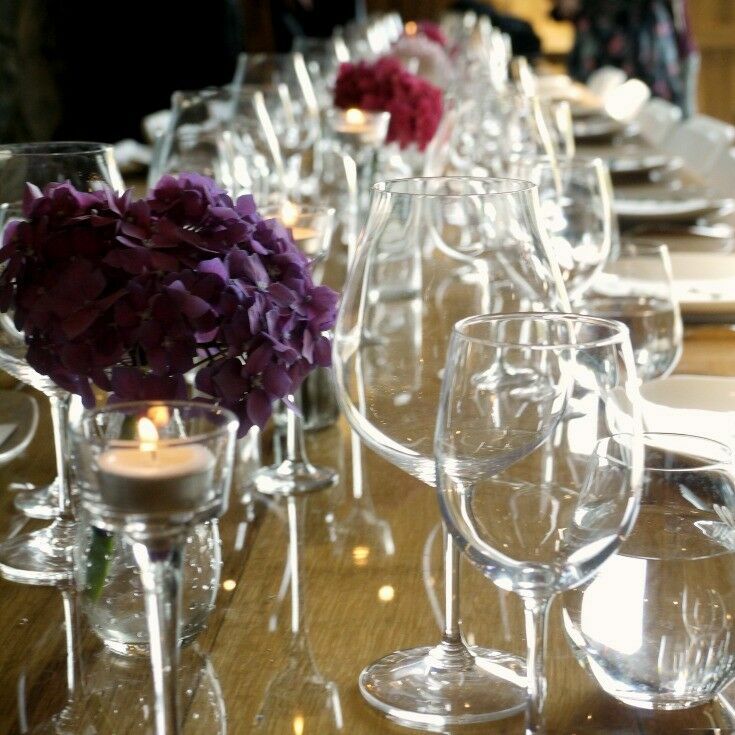 The tasting room itself is a beautifully rustic space with a welcoming, intimate feel. 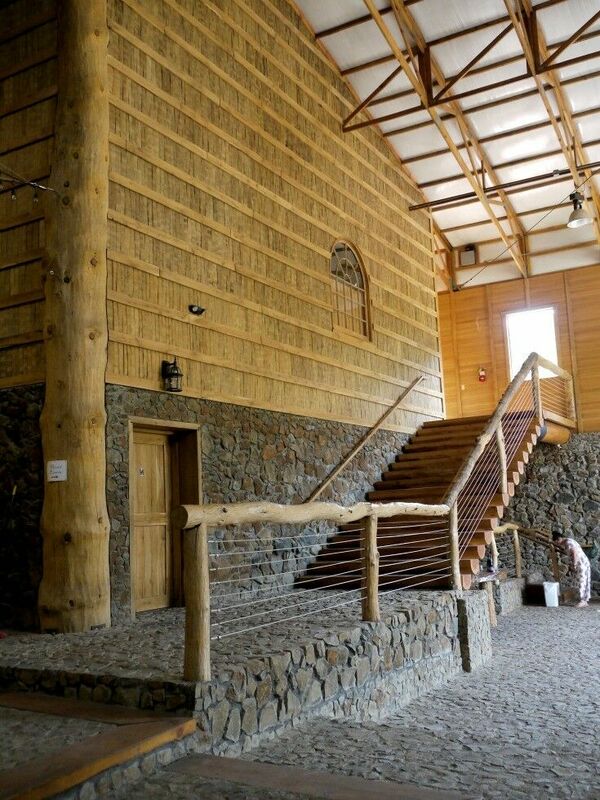 The bar in the tasting room is the end-product of a massive oak tree that was felled on site, and the rough-hewn field stones from the property make up the ten-foot high walls. 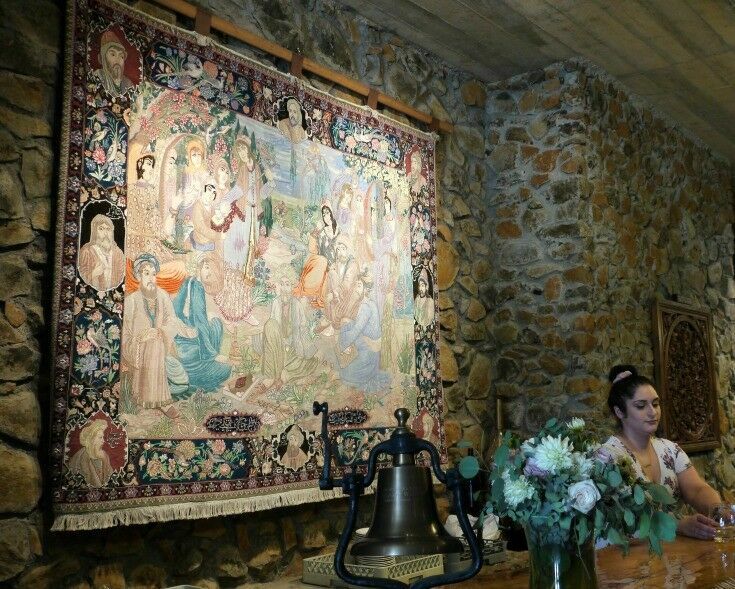 A beautifully detailed tapestry depicting the Persian poet Rumi reciting one of his poems to a group hangs behind the bar. The air itself is changed with warm light: it is a space designed to welcome and embrace. 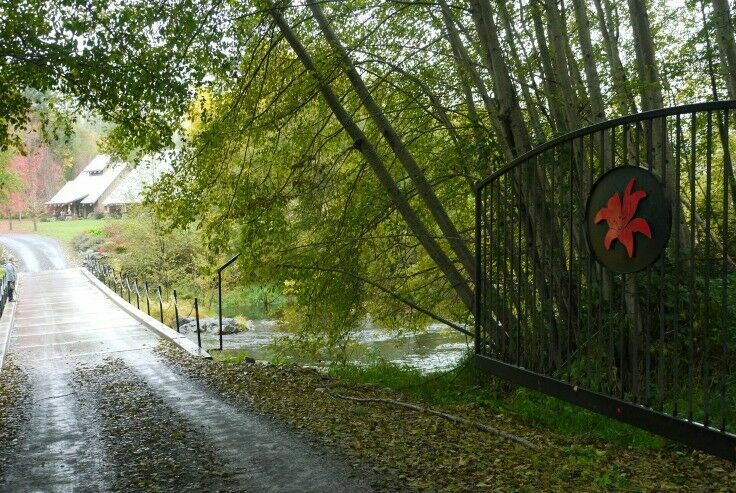 Maysara Winery isn’t one you are likely to simply stumble across in your next tour through Oregon wine country. 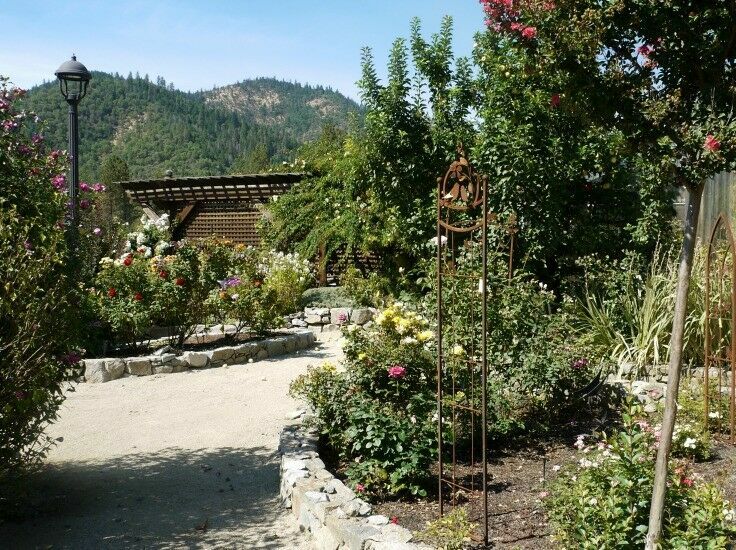 Just bit off the beaten path (five minutes off Highway 18), Maysara is a destination for which you set out with the intent of spending a relaxing few hours. It is most definitely worth the drive. The Momtazi family was beyond gracious during our visit, welcoming us to their winery and to their table like old friends. 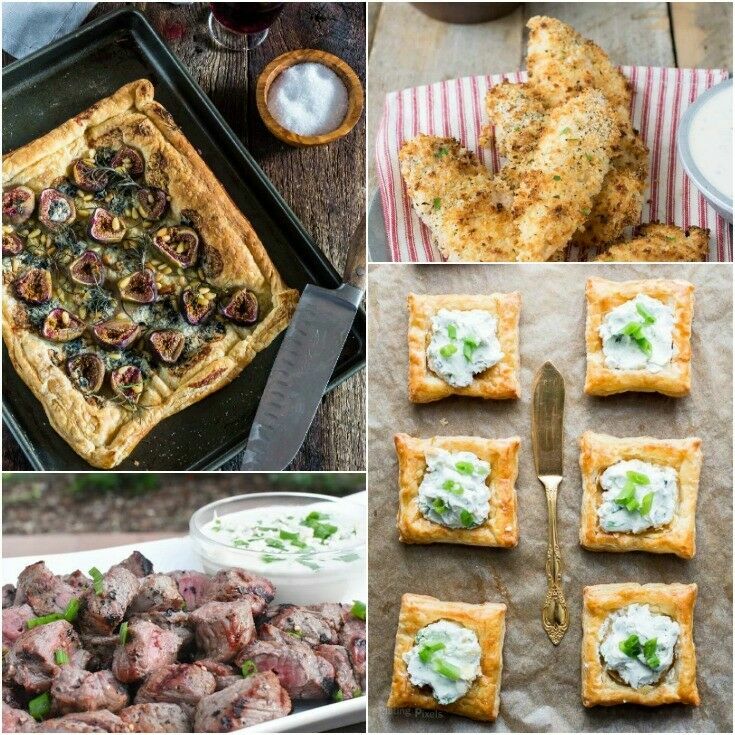 Family matriarch Flora Momtazi, known for her middle-eastern cooking, made all the food for our gathering herself, every dish a sumptuous nod to the family’s heritage. 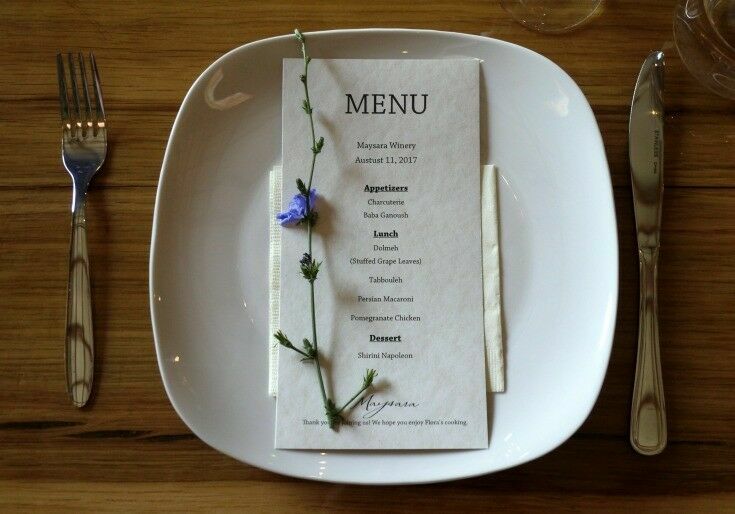 Our Persian-inspired menu was rustically elegant, from the homemade Baba Ganoush to the Shirini Napoleon. 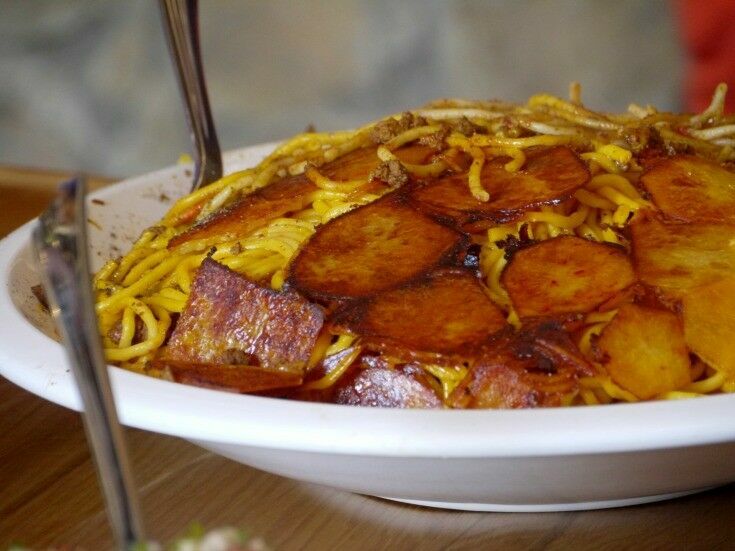 Flora Momtazi’s Persian Macaroni was fabulous! 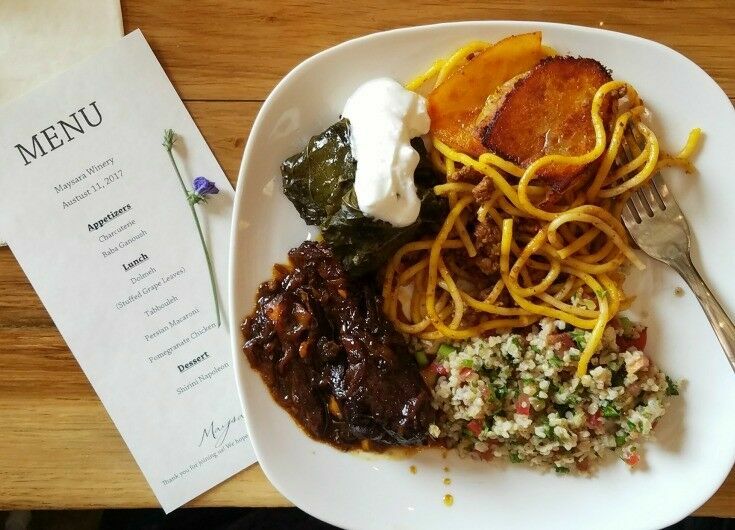 Between lunch and dessert, we learned that after studying at the University of Arlington in Texas back in the 70’s, Moe returned to Iran. 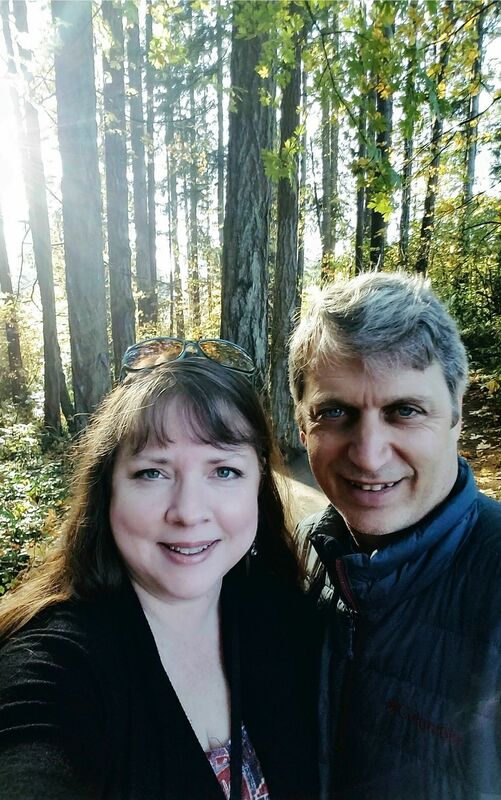 However, as life for the Iranian people darkened following the 1979 revolution, he knew he wanted to return to the US, so in 1982, he and his wife Flora escaped. They made their way west through Spain, where their oldest daughter, Tahmiene, was born. After arriving in the US, they added to their family as younger daughters Naseem and Hannah arrived. 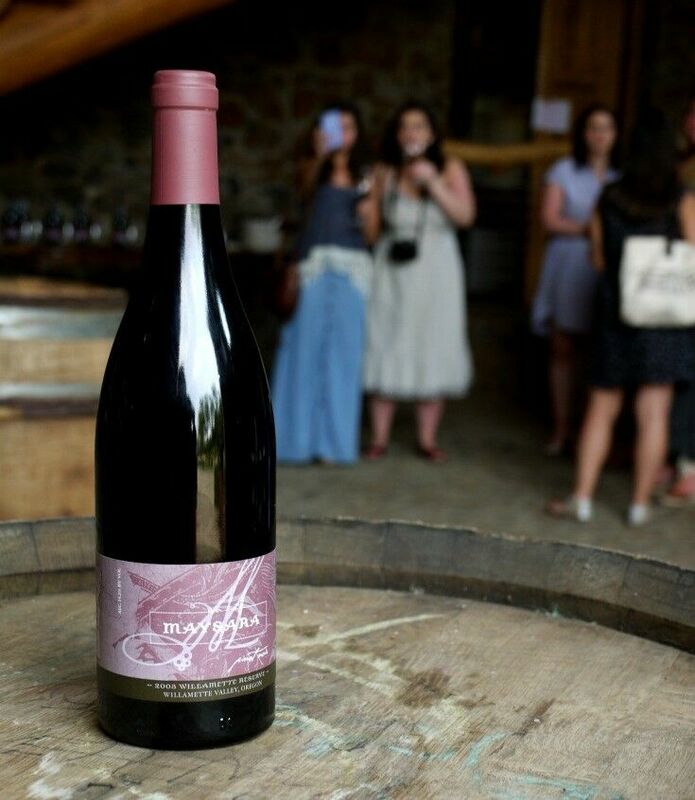 Each of the three Momtazi daughters fills a distinct role at Maysara Winery. 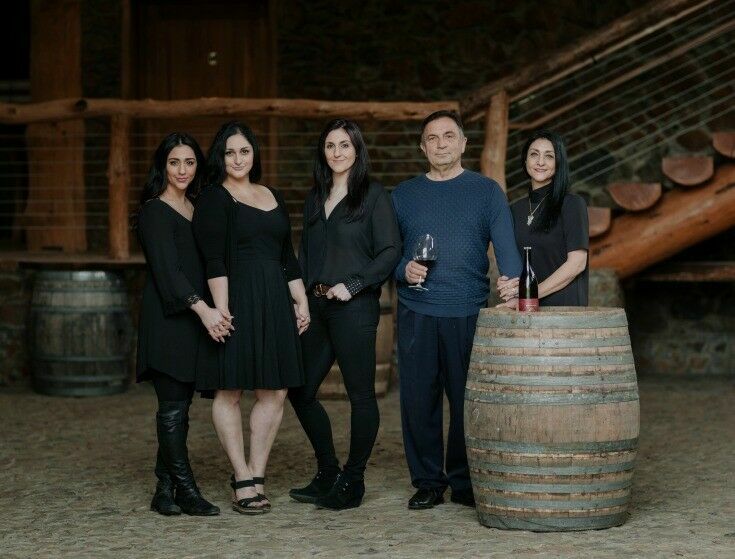 Tahmiene Momtazi, the eldest, is the primary Winemaker. Middle daughter Naseem is responsible for national sales and distribution. The youngest, Hanna, with her bright smile and open, convivial disposition, serves as the Events and Hospitality Manager. I could write a whole separate post about the food! Savory and rich, every bite was genuinely delicious and authentically comforting. We try to keep a natural balance. 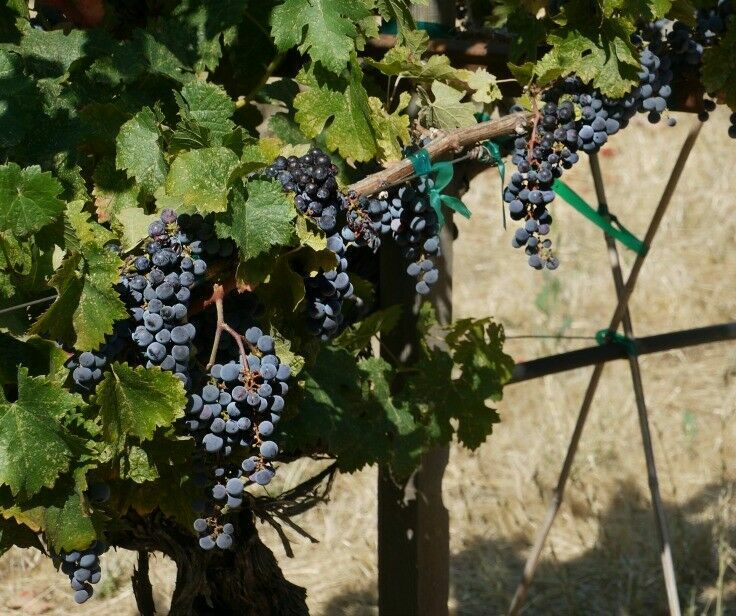 Healthy soil and healthy vines will produce healthy fruit. Currently, Maysara Winery offers Oregon Pinot Noir, Pinot Blanc, Riesling and Pinot Gris, and a Sparkling Pinot Noir Rosé. My personal favorite from our visit was their Pinot Blanc (sorry, I forgot to note the year), which I found to be a rich, well-balanced, refreshing glass that paired especially well with the firm cheeses and savory charcuterie selections, and very affordable at just $20 a bottle. Originally a civil engineer, Moe Momtazi’s passion for architecture and building is evident everywhere you look. 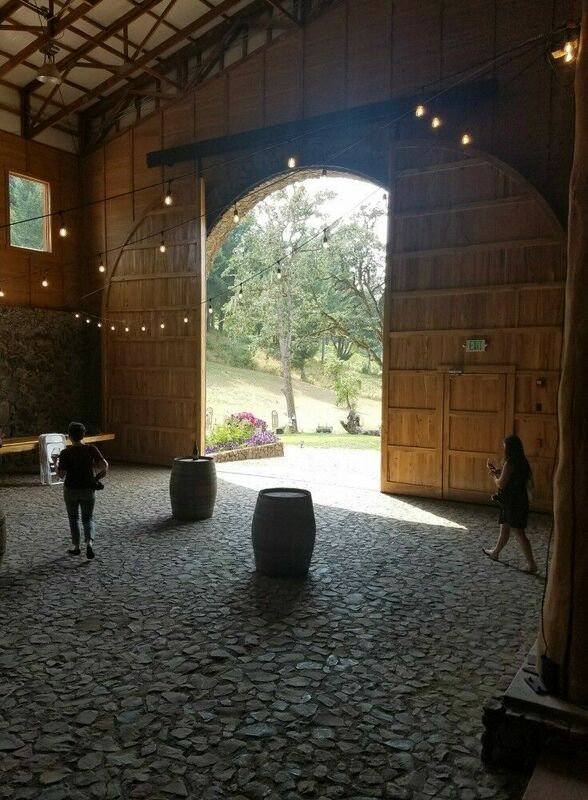 As one of the largest indoor and outdoor venues in Oregon Wine Country, it’s difficult to effectively convey the architectural beauty and massive nature of the main Maysara Winery in just a few photographs. 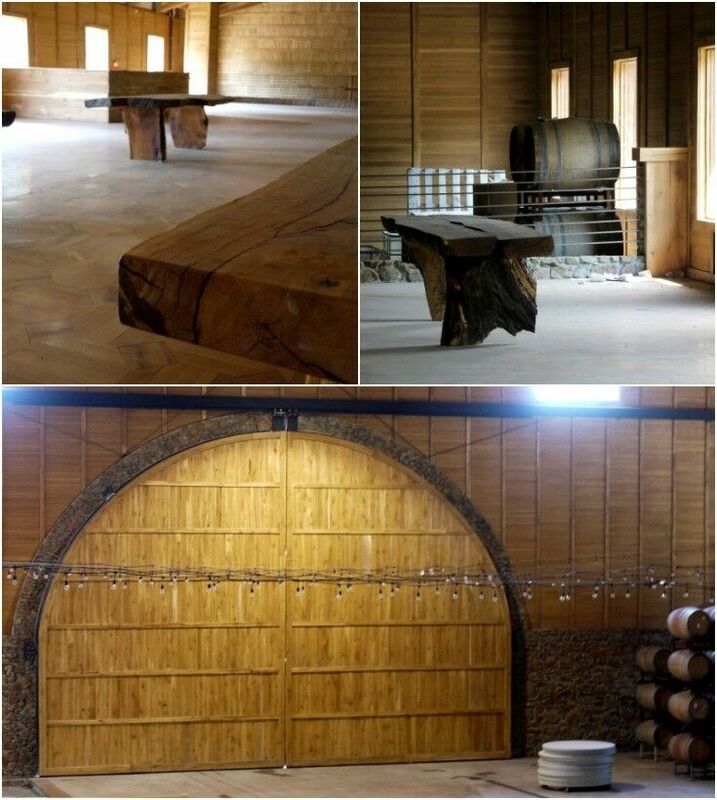 Even more impressive is that nearly everything you see – from the stone floors and walls of the massive winery to the boards of the tasting room ceiling are made with materials from their land. The walls of the immense common room in the winery are faced with flatten staves, giving it the appearance of an old, carefully lined bookshelf. 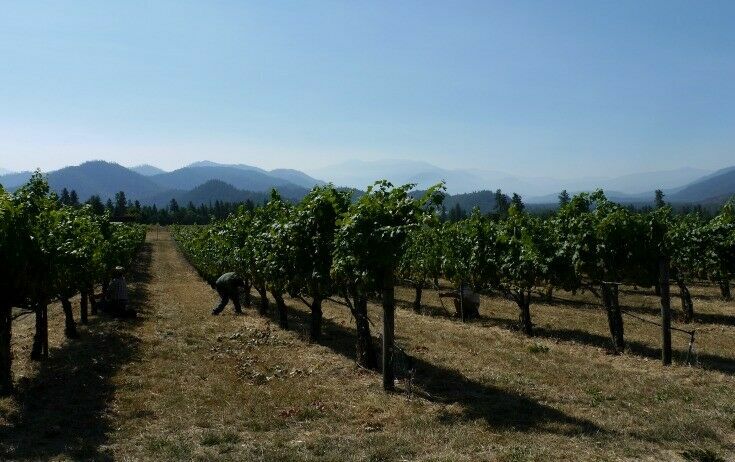 From their stewardship of the land to the wines they produce, Maysara Winery and Momtazi Vineyard stands as the legacy of a gracious family; reflecting appreciation, dedication, and passion – to the past, the present, and the future. 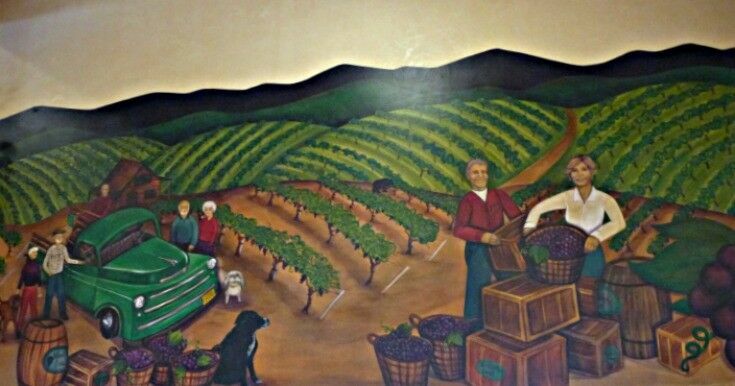 Note Hannah Momtazi standing in the lower right corner, lending perspective to the massive nature of the winery itself. I was not only impressed by their wines and facilities, but by my whole experience at Maysara Winery & Momtazi Vineyard. 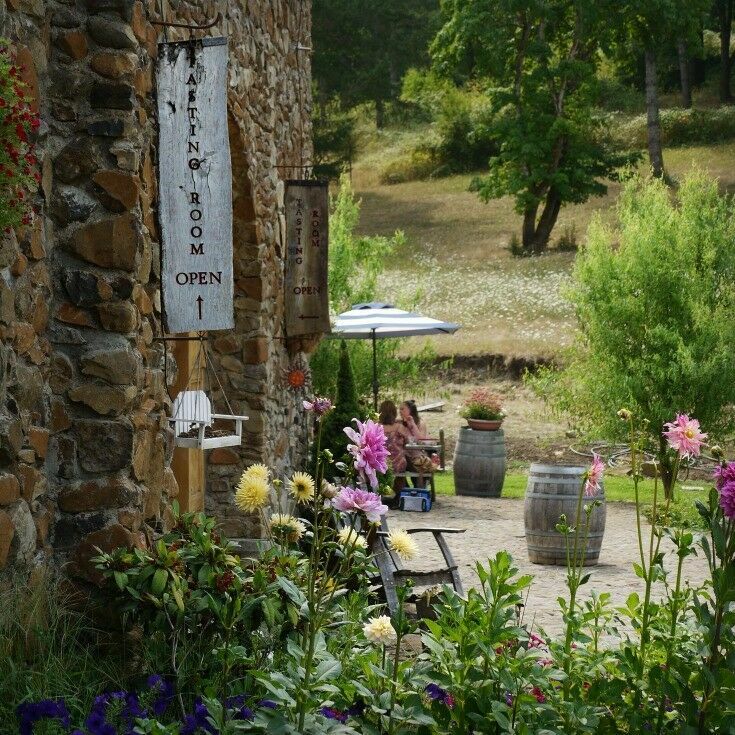 If a relaxing drive in the country and an afternoon of wine-tasting and storytelling sounds appealing to you, I highly recommend you make a visit. 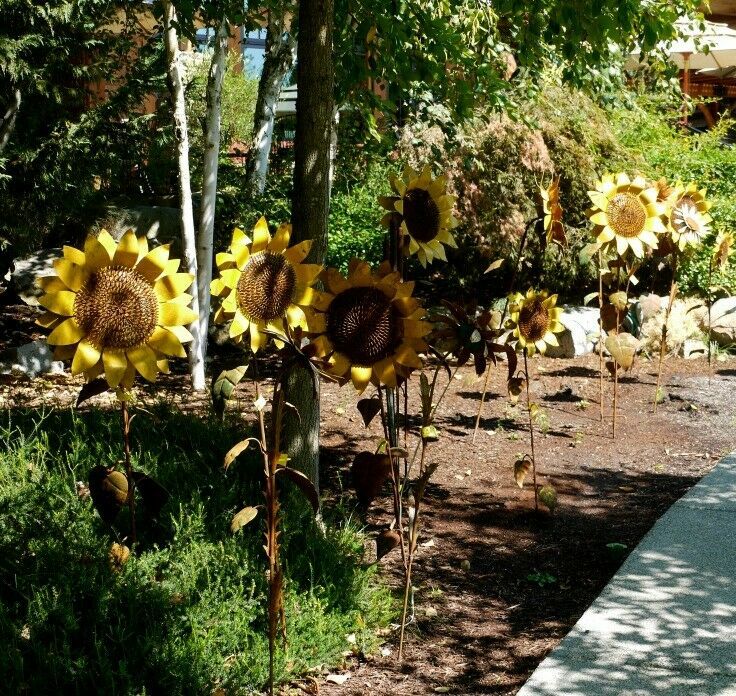 Maysara Winery is about a 1 ½ hour drive from Portland. 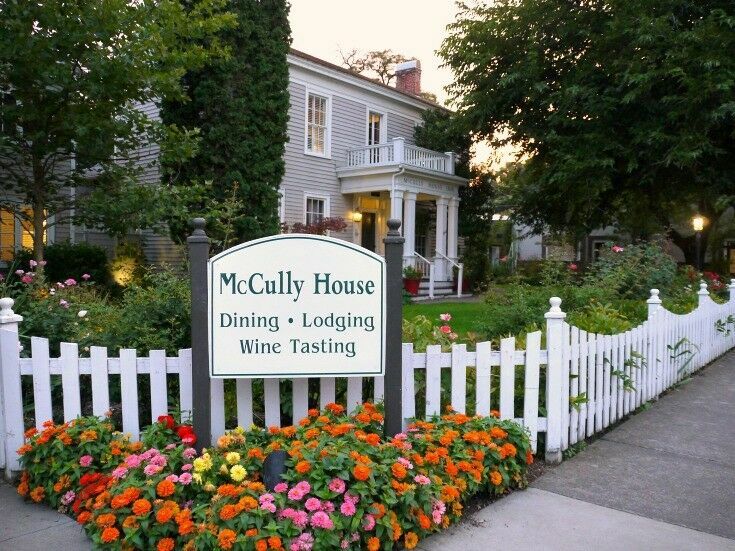 Tasting room hours change seasonally, and due to special events on select Fridays, Saturdays, and/or Sundays, they may be closed for a private events beginning at 2:30pm, so be sure to call before you go. Groups of seven or more require a reservation. The tasting fee is $15. Many thanks to the Momtazi family for hosting our meal and winery tour. As always, all opinions and images (except as noted) are mine. I know what you’re thinking. 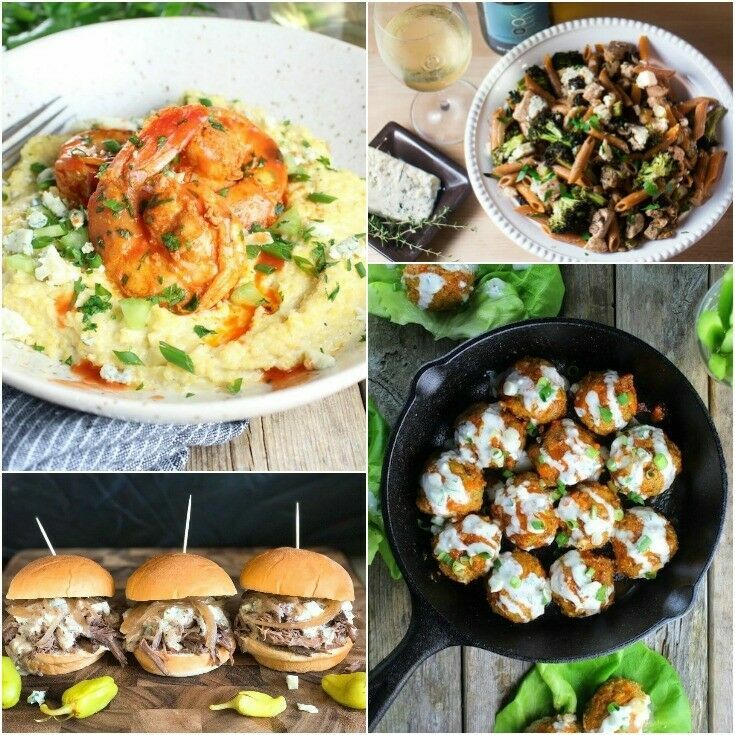 What does a wine blogger know about cookbooks? My answer is simple. 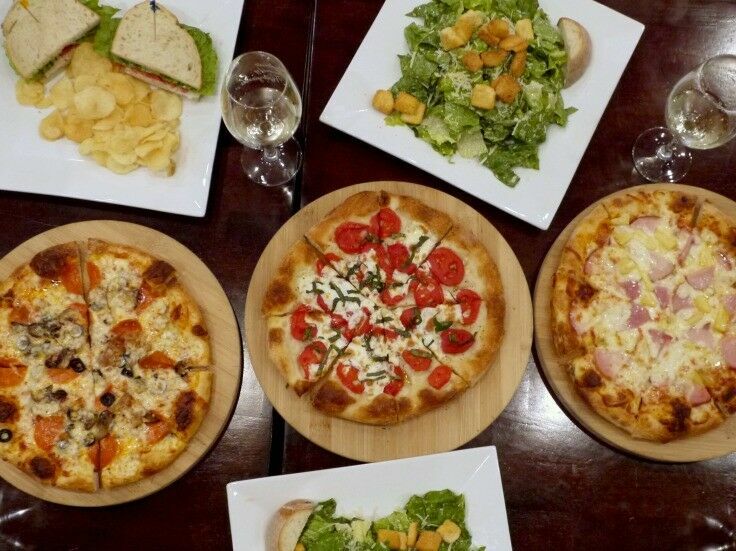 Wine and food go together like peanut butter and jelly! While it’s not necessary to have wine with every meal, making a good meal is key to enjoying any wine and food pairing. Yes, there is. 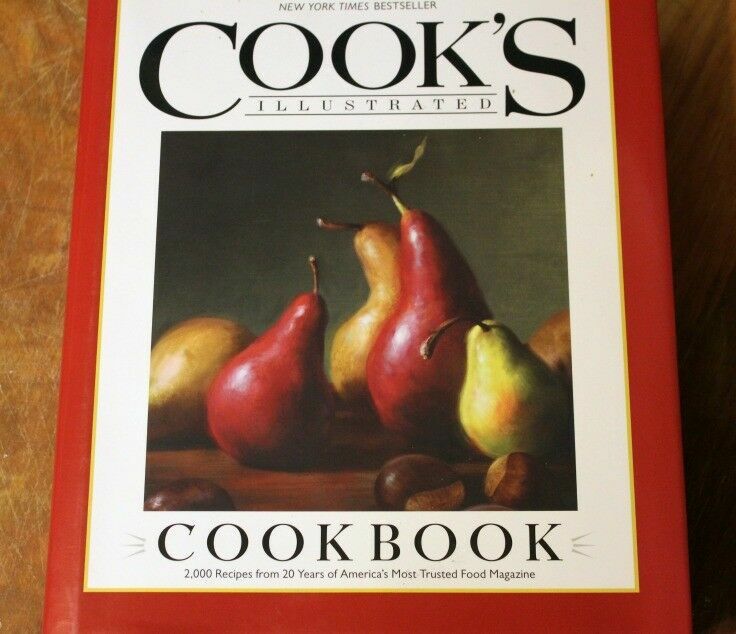 My favorite cookbook is the “Cook’s Illustrated Cookbook.” In over 20 years of publication, Cook’s Illustrated has shown people around the world that cooking isn’t rocket science. All it requires is a simple approach, a well-laid plan, and the ability to follow directions. I love how this book is broken down. 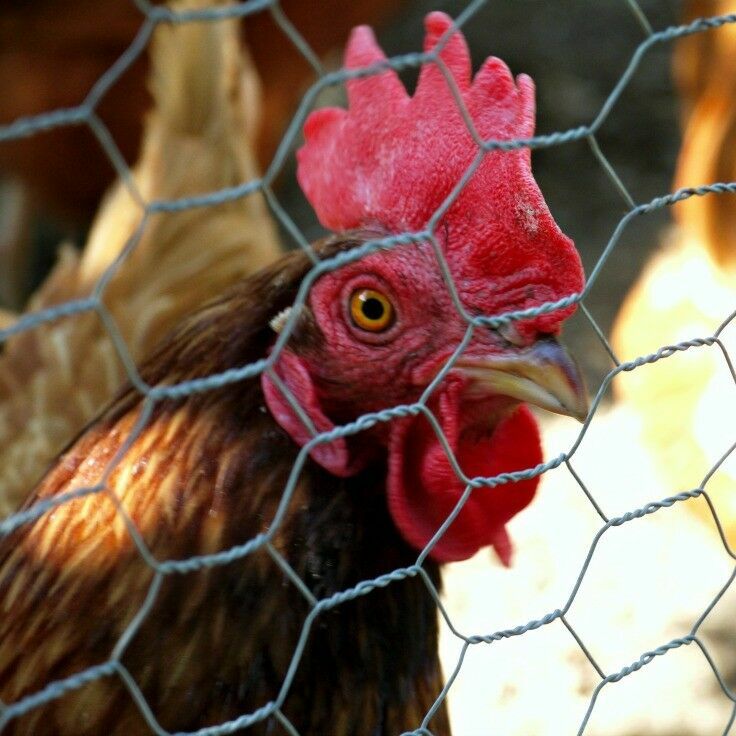 While the traditional sections of a cookbook, such as appetizers, salads, and soups are in there, there is also sections for poultry, meat, fish & seafood, and grilling. Even the dessert section is broken down into their sections. Within the sections, they break things down even further with subsections of each of the main sections (i.e. grilling has a separate section for poultry, meat, etc.) so that you can find something of the same style easily. Not only is the cookbook laid out beautifully, but there is a “why this recipe works” note on each recipe. It explains the process they used, including the variations they tried, to get the recipe to the point where they felt it was “perfect”. In addition to the “why this recipe works” note, there are also additional variations of a recipe after the main one. My favorite feature, though? 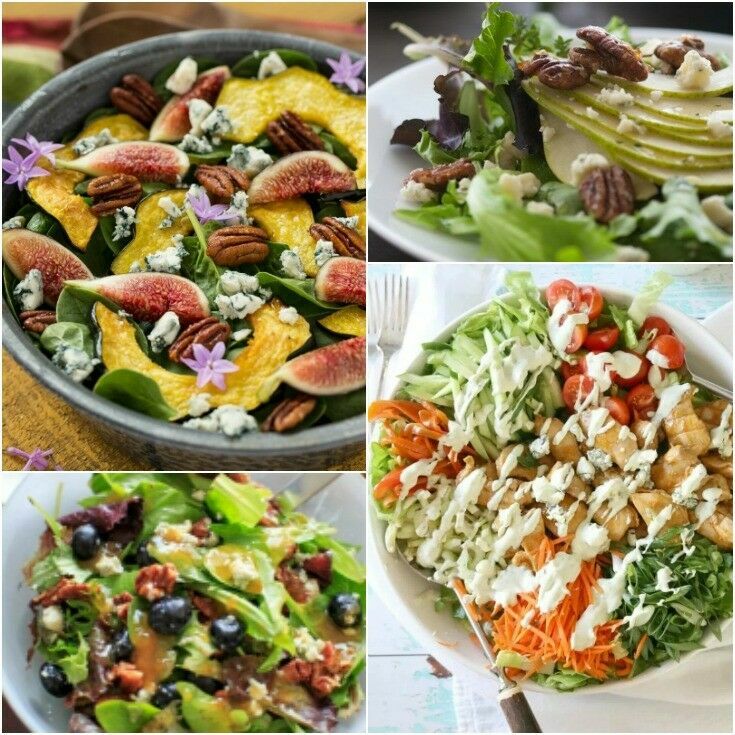 There are over 150 tips interspersed throughout the cookbook. These tips include everything from getting the perfect measure for baking to storage tips. There are also many beautiful illustrations in the book, showing one how to do everything from peeling tomatoes to carving a chicken. The Cook’s Illustrated Cookbook is well worth the investment. Yes, it’s heavy and thick. However, having this as part of your collection, or giving it as a gift to a young person (or couple) just starting out, is practical. About Alina: Alina Ferguson is the “Chief Wine Dork” behind the wine blog One Girl, One Glass, One World. Known for her down-to-earth approach to wine, she has featured wines from areas around the world without coming off as pretentious or snobbish. She has traveled to some of the most notable wine regions on the west coast of North America, but the Portland, Oregon area is home.